WELCOME TO THE CALCULATOR MUSEUM. It contains over 140 calculators, starting with mechanical machines dating back to at least the 1920s to electronic pocket calculators beginning in 1970. I remember a man coming to my eighth grade math class in 1970 or 1971 and showing us a desktop electronic calculator costing hundreds of dollars. I was amazed. It did the difficult math we were doing almost instantaneously. 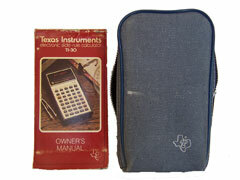 While I was in high school (1971-1975) the first pocket calculators came out. I envied my friend's TI SR-50 scientific calculator which cost about $150 (over $600 in today's dollars). My dad got the family a Sharp ELSI 8107 with basic operations when I was a senior in high school. I bought a Commodore scientific calculator while a freshman or sophomore at UCSD for $50 (see Vintage Technology Museum for an example) and a beautiful Sharp LCD scientific calculator (below) a year or two later for about $40 when the Commodore broke. Not having a calculator for math through grade 12 made me good at doing hand calculations, and gave me a great appreciation for calculators. 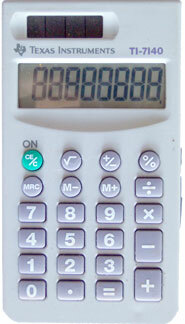 The Calculator Museum is divided into several sections generally by manufacturer. 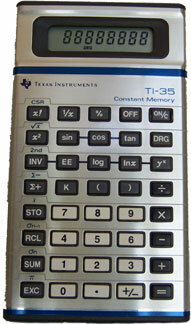 The largest holdings are Texas Instrument (TI) calculators. I have divided the TI calculators by type of display, LED or LCD. LED stands for light emitting diode. With LED displays the numbers light up in red. LCD stands for liquid crystal display. LCD displays usually have black numbers against a silver background. 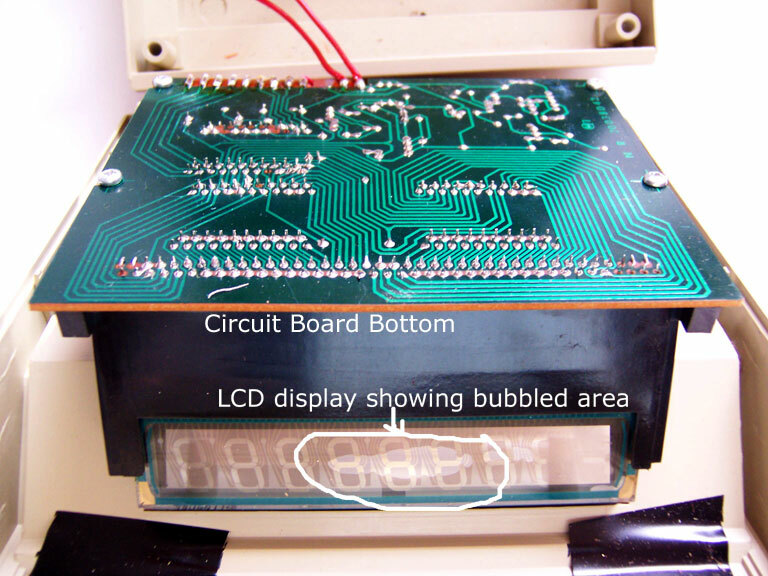 At the time of LED displays, there were also vacuum fluorescent displays displaying greenish or bluish numbers. LCD displays rapidly took over since they use a tiny fraction of the energy of a LED or fluorescent display and hence batteries rarely need to be replaced. LCD calculators are also much smaller. For more information on display techonology see Museum of Soviet Calculators on the Web with a reprint of an article in International Calculator Collector (Spring 1997). My collection represents only a small fraction of TI calculators. For very comprehensive and detailed information on TI calculators, I recommend you browse through www.datamath.org. 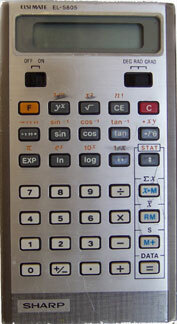 My museum also contains sections for calculators from Sharp, Casio, Hewlett Packard and other manufacturers. Where I could find or remember information, I have included the approximate price of the calculators. It is striking how rapidly prices declined. Visit often. Additions are made every so often. Donations of vintage calculators are also always gratefully accepted. 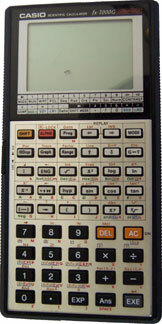 TI Datamath,also known as the TI 2500, was the first TI pocket calulator. 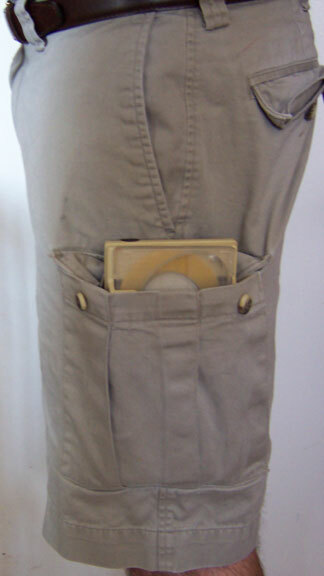 (But see the Canon Pocketronic below.) Manufactured in 1972-73, they originally sold for $119.95, over $550 in today's dollars, enough for a laptop computer. There were several versions of the TI 2500. My TI 2500 is in good working condition. 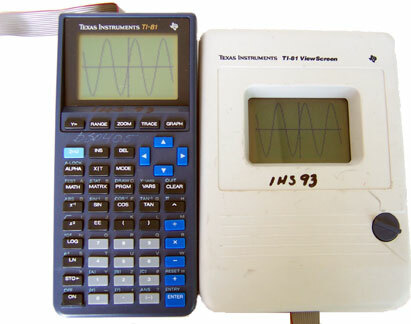 Be sure to check out the history section of www.datamath.org for an excellent discussion of the development of the Datamath calculator and TI's two desktop calculators, the TI 3000 and TI 3500 introduced at the same time. Manual Cover, Datamath Box. 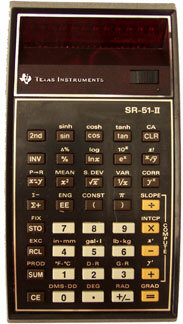 TI SR-10,TI's first "scientific calculator," since it has scientific notation. Different versions manufactured from late 1972 to 1975. Original price was $149.95. Mine is a version 2 which sold for $89.99. Good cosmetic condition, but does not work. Battery compartment is heavily corroded. I tried it with regular AA batteries, but it may be too heavily corroded and the wire to the + terminal seems to be loose. Also, there may be some corrosion near the negative terminal on the circuit board itself. See internal view. Click on Datamath - Internal Views for interior views of the three versions. Manual Cover. I later acquired a working SR-10 on eBay on July 30, 2005 for $4.99 plus $5 shipping from the original owner who used it in college. 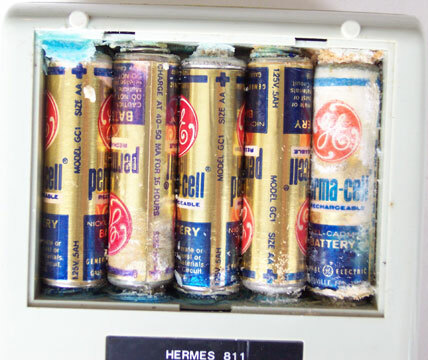 The original NiCad batteries were removed and there is some corrosion. It works with three AA batteries, however. It comes with a charger which cannot be used without the NiCad batteries. 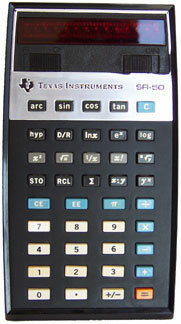 TI SR-50 (1974) TI's first true scientific calculator. I wanted a SR-50 in 1974 while in high school, but it cost about $150 - in excess of $600 in today's dollars. This example works well. Another example (a gift) does not have the rechargable battery. Manual Cover, Box, Case. Datamath.org has excellent and detailed information about the TI SR-50. TI 2550, January 1974, successor line to the original 2500 calculators, the TI 2550 added a full memory function, with a price tag of $99.50. There is an excellent discussion at www.datamath.org including a copy of the manual. My 2550 was purchased on July 18, 2005 for $.99 with $5 shipping. It is in nearly new working and cosmetic condition with case. It does not have an AC adapter/charger. I use it with four AA batteries. It is also designed to work with three NiCad batteries. I purchased a second one, also in excellent cosmetic and working condition, on October 20, 2005 for $1.25 plus $2 shipping. TI 1200, red LED calculator. Manufactured in 1975. The price was only $24.95 compared to $119.95 for a TI 2500 less than three years earlier. One 9 volt battery. Working, except display is cracked. I purchased a second one on eBay on 11-11-05 in perfect working condition as part of a lot of 24 calculators and organizers for $9.99 and $7.30 shipping. TI 30, red LED scientific calculator. One nine volt battery. Compare the $24.95 price in 1976 with the $150 price of an SR 50 two years earlier. I have several working examples, one with one LED cell broken. One belonged to my father-in-law.Case and Manual. 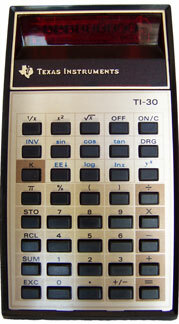 TI SR-51-II, 1976-79 scientific. Original cost $79.95 ($270+ in 2005 dollars). Datamath.org has an excellent technical discussion including internal photographs. Purchased on eBay 7-5-05 for $2.29 ($4 shipping). No AC adapter included. BP-6 battery pack discharged and shows corrosion. The battery pack is 2.4 volts. I took two modern 1.2 volt AA rechargeable Ni-MH batteries and put them in a battery holder I got with a model electric car kit. I put the two wires that attach to the battery holder into the two central holes in the calculator's battery connector experimenting to see which wire went into which hole. I held the battery holder in with clear packing tape. The calculator now works perfectly! An AC adapter/charger can no longer be used. 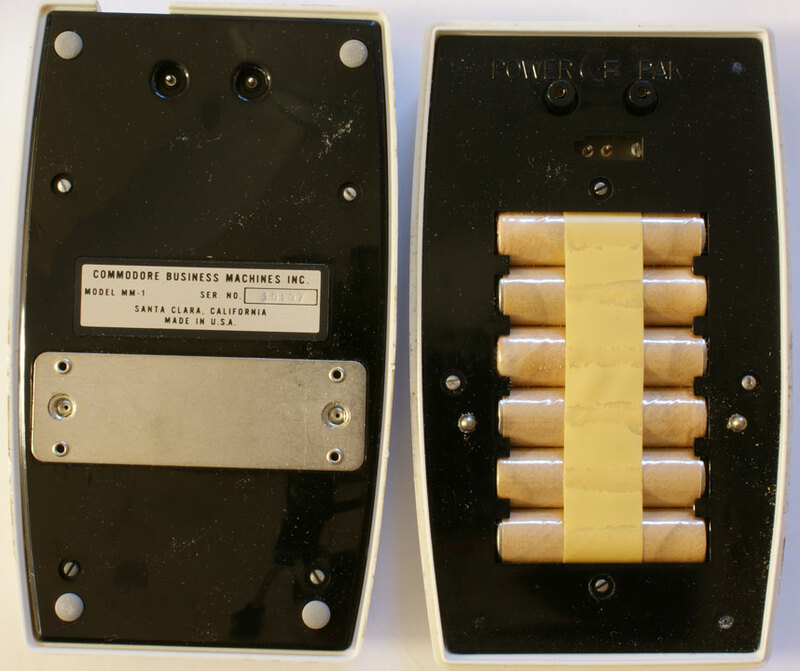 The Ni-MH batteries can be removed and charged in their own charger. 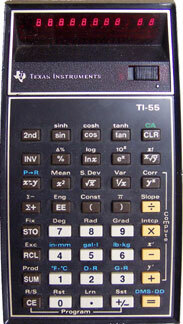 TI 55 (1977) red LED scientific calculator made in the U.S. with limited programming capabilities. 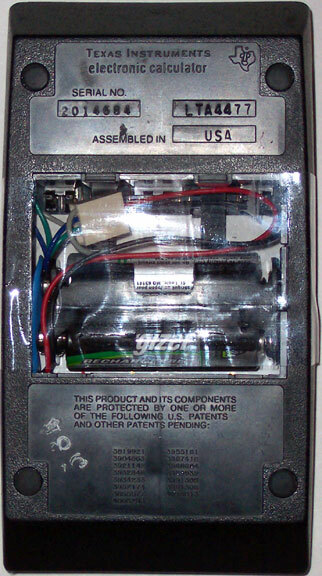 Originally it used a BP77 rechargeable battery pack but the seller converted it for use with a 9 volt battery. Purchased on eBay on July 17, 2005 for $2.75 with $8 shipping, it is in excellent cosmetic and working condition. See datamath.org for more details. 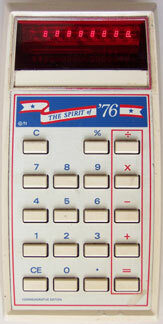 TI Spirit of 76 (1975) bicentennial version of the TI-1200 purchased in August 2005 on eBay. In very good working and cosmetic condition. Runs on one 9 volt battery. TI SR 11, introduced September 1973 as the successor to the SR 10. A scientific caluclator in that it has scientific notation, square root, 1/x and x squared. It does not have trigonometric and log functions, however. This was purchased on eBay on October 7, 2005 with 5 other calculators for $20.50 plus $5 shipping. It is in good cosmetic condition with the trim worn with use. It is in excellent working condition with the internal rechargeable batteries still holding a charge. Came with the box, original manual, AC adapter/charger (AC9200) and original sales receipt indicating it was purchased in Wichita, Kansas on September 23, 1974 for $79.95, significantly less than the $119.95 introduction price a year earlier. Serial number 80624. Datamath.org has excellent information including x-ray images and internal views. 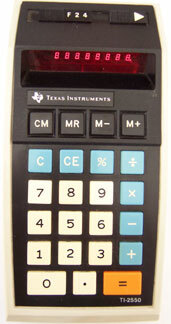 TI Business Analyst I (1979) budget successor to the Business Analyst using a 9 volt disposable battery. According to datamath.org price was $24.95 later reduced to $20. This was purchased on e-Bay on October 7, 2005 with 5 other calculators for $20.50 plus $5 shipping. In excellent cosmetic and working condition. 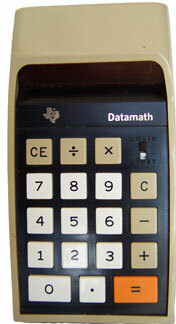 TI Dataman according to datamath.org, introduced in June 5, 1977 for $24.95. Uses a 9 volt disposable battery. You type in an equation such as 5 + 2 =, put in the answer, and it flashes that you are right. The original came with a booklet describing "The Story of Dataman" which is available on datamath.org in pdf format on the link above. Purchased on eBay in 2005. In good cosmetic and operating condition without the booklet. 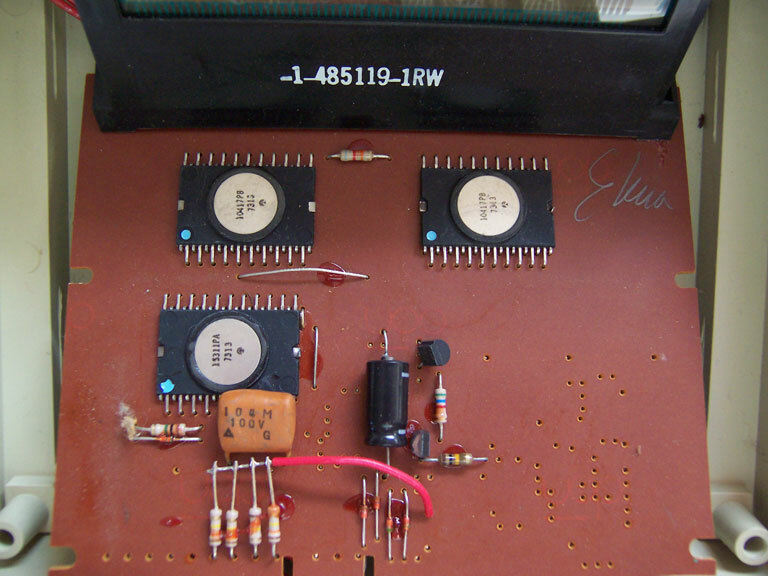 TI 1000, (1978) a simple LED calculator operating on 9 volt battery. It originally sold for only $9.77 compared with the $120 datamath sold six years earlier. Purchased on eBay on 11-11-05 in a lot of 24 calculators and organizers for $9.99 and $7.70 shipping. In good cosmetic and working condition. 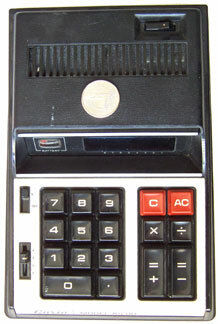 TI 1025 (June 1977) operates on 9 volt battery. While most early TI calculators had LED displays, the 1025 has a fluorescent diplay. As a step up from the 1000, this includes a square root key and memory. Originally sold for $11.77. In good working and cosmetic condition. From the wear on the keys you can tell this calculator was well used. Part of the lot of 24 calculators referred to with the TI 1000 above. 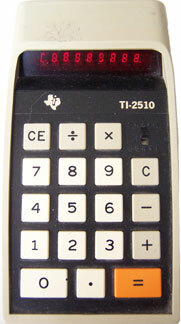 TI 2550 III (1976) New $29.95: 25% of an original Datamath with more functions - square root, square, inverse, +/-, and memory. Serial no. 081345. Assembled in USA. Purchased on eBay on 12-31-05 for $2.95 with $3.75 shipping. Near new cosmetic condition. Ebay description said it worked with an AC adapter (not provided). I cracked the simple BP 3 battery pack open and removed the Nicad battery with corrosion on the + terminal. I replaced it with a AA Ni-MH battery. I used the old battery to wedge the Ni-MH battery in place. After playing with the metal tabs a bit, I got it to work! You would not charge the battery in the calculator with this arrangement. Datmath has nice photos of all TI battery packs. 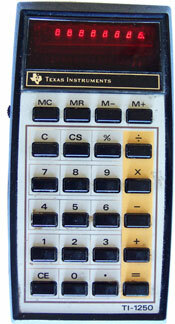 Montgomery Ward P200, (1974) made by Texas Instruments and a slight variation of the TI 2550 above. Model No. TXI-8662A. Serial no. 47X-021715. Assembled in USA. 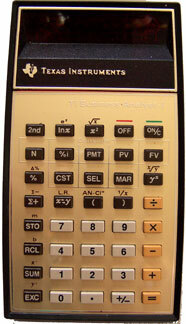 Additional information at datmath.org under calculators made by Texas Instruments. Purchased on eBay on 1-16-06 for $1.99 plus $5 shipping with AC adapter. Significant bright blue corrosion in battery compartment. Originally did not work with batteries. I chipped away the corrosion, however, and it works fine now. 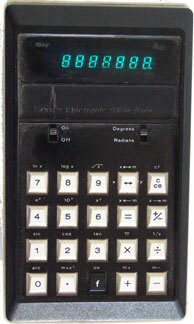 TI 1270, (1976) 8 digit LED display. 9 volt battery. Assembled in USA. While not a true scientific calculator, it has several advanced features including reciprocals, squares, square roots, +/- key, Pi and memory. Neat orange face! Additional information at datmath.org. Purchased on eBay on 2-2-06 for $4.99 plus $3.50 shipping (sole bidder). Excellent cosmetic and working condition. No corrosion in battery compartment. 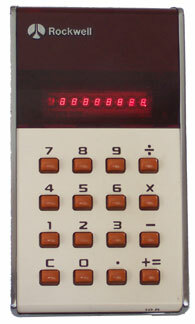 TI 2510, (1973) Datmath.org indicates there were two versions of the 2510 one introduced October 1973 and the other in January 1974. Both sold for $59.95. Large 3D image is available at datamath.org as well as a copy of the manual. It was one of the last of the Datamath series. Mine was purchased on eBay on 2-7-06 for $1 with $6.63 shipping along with a TI-3500 (no cord), TI-30 (LED) and early LCD Databrain (damaged LCD), all working. A great deal! Serial no. 2510010203. 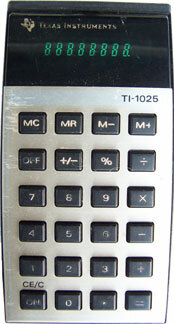 TI 1450, (1976) slight variation of the TI 1200 introduced a year earlier. According to datmath.org sold for $16. Assembled in USA. Operates on 9 volt battery. Can use adapter 9180. Purchased on 2-20-06 on eBay as part of a lot of six calcuators for $11.50 plus $10.94 shipping. In excellent cosmetic and operating condition with case. 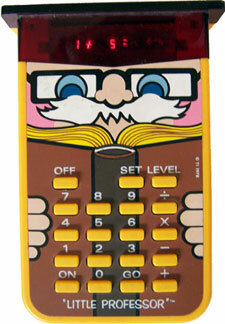 TI Little Professor, (1980) third version of this popular LED calculator which quizzes kids on math facts. Purchased on 2-20-06 on eBay as part of a lot of six calcuators for $11.50 plus $10.94 shipping. In very good operating and cosmetic condition. Assembled in USA. Operates on one 9 volt battery. 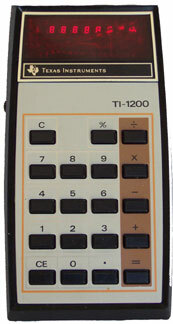 TI 1250, (1975) introduced June 1975 with a selling price of $24.95 as a slight variation of the TI 1200 according to datamath.org. The manual for the TI 1200, 1250 and 1270 is also available at datamath - manual. Mine was purchased at a condo flea market on 4-8-06 for $1. It is in good cosmetic and operating condition except unfortunately the top right segment in the far right LED element does not work. Also, the battery cover does not latch properly. Assembled in USA. Serial No. A 1808220. TI Speak & Spell, introduced in 1978 at a price of $50. 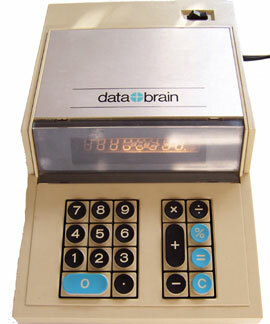 The original version had button keys and was replaced in 1980 with a second version (see Datamath) with membrane keys. Mine is a late run of the original version with AC input (or 4 C batteries) and a headphone jack. 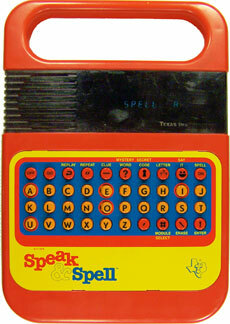 Datamath has extensive information on the Speak & Spell under the category of "Speech Products." Be sure to follow all the links within Datamath to get the full story. Datamath also has extensive internal photos. As explained in Datamath, this toy used recently invented voice synthesization to say letters and words. It included several different types of word games. A novel use of a Speak & Spell is by ET, the Extraterrestrial, who used a modified Speak & Spell to phone home in the 1982 movie. Pretty cool since home was far away! People also modify Speak and Spells and other voice synthesizer toys to make strange sounds or music in a process called "circuit bending." Several other sites have information on this innovative toy: 99er.net, Wikipedia, Speak & Spell Emulator, another Emulator, Nostalgia, Speak N Spell. Mine was purchased on eBay in 2005 or 2006. It is in good cosmetic condition. The battery cover is missing. Originally it worked only with an AC adapter. There was some corrosion on one of the battery compartment terminals. With some Aluminum foil wedged in I finally got it working. The main game of the Speak & Spell saying a word, and then the player spelling it, does not seem to work, however. It is serial no. 5546862 and was assembled in the USA. Back removed. 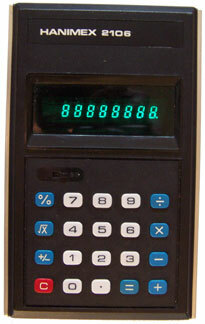 TI 3000, according to www.datamath.org introduced in 1972 along with the Datamath pocket calculator. It sold for $84.95. 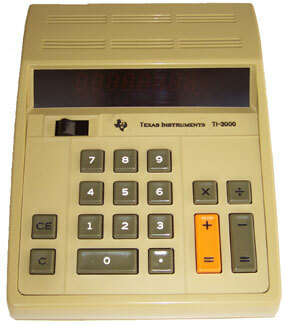 The TI 3000 and TI 3500 were Texas Instruments first desktop calculators. It has an interesting orange "Panaplex II" display. Purchased on eBay. Excellent working condition. The manual is available as a pdf document at www.datamath.org. 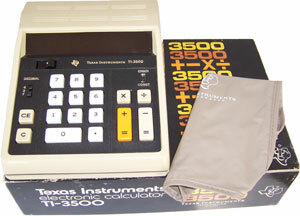 TI 3500, according to www.datamath.org introduced in 1972 along with the Datamath pocket calculator and the TI 3000 desktop. The TI 3500 sold for $99.95, over $460 in today's dollars, more than enough to get a nice desktop computer today. 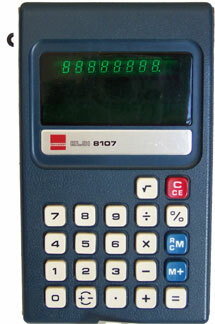 The TI 3500 had a 10 digit display instead of the 8 digit display of the TI 3000. The TI 3500 also had switches to change the decimal point and to switch between chain or constant calculations. My TI 3500 was purchased on eBay on May 8, 2005 for $0.99 with $8.50 shipping. It is in like new working condition with the manual and box. The manual is available online as a pdf document at www.datamath.org. TI 5142 III, 1983 desktop calculator with printing tape and fluorescent display manufactured in Japan by Toshiba according to www.datamath.org. Purchased on March 12, 2005 at a garage sale in the San Carlos area of San Diego for $.50. In excellent working condition except for faint printout. 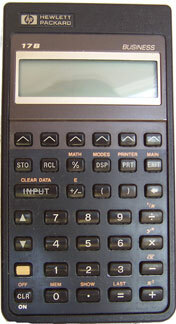 TI 1750, TI's first LCD model, it was first introduced in 1977 for $24.95. It has a yellow background display. LCDs were a major breakthrough using a tiny fraction of the energy of LED models. Good working condition. 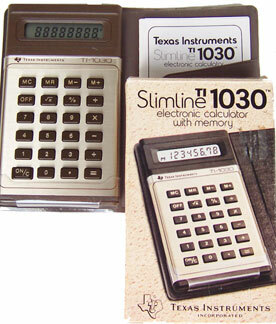 TI 1030, according to the Datamath site, the TI 1030 was the first US built TI "slimline" calculator. It was introduced in June 1978. It was inexpensive to build and used less than one thousandth of the energy of the Datamath just six years earlier. (According to the Datamath site, 0.4mW compared to 550mW.) Batteries now lasted years instead of hours. Purchased on eBay in March 2005 for $1 with $1.42 shipping in like new condition. 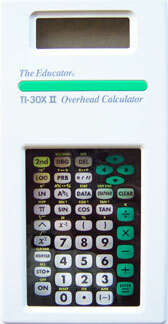 TI 35 LCD, 1982, price $20, Silver color. Like new cosmetic condition, although keys are "sticky." I don't think it was ever used because of that. 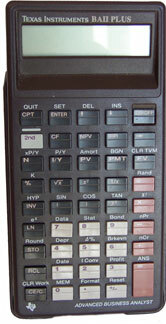 TI Student Business Analyst 35, 1985 financial calculator. I purchased this new at "Best" in Boise, Idaho, and used it over the years to calculate mortagage payments. It has been very reliable. TI Business Analyst II Plus, 1991, purchased new. Good working condition. 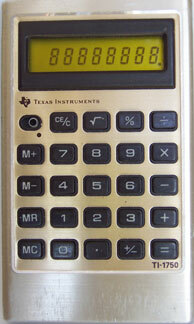 TI Math to Go, 1990, purchased new at Costco. Quizes you on math facts. Does not do decimals. Batteries have leaked. TI 30X IIS, solar powered, two line display. 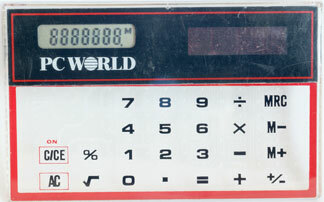 First introduced in 1999 along with several other two line display calculators. Two line display is very handy. 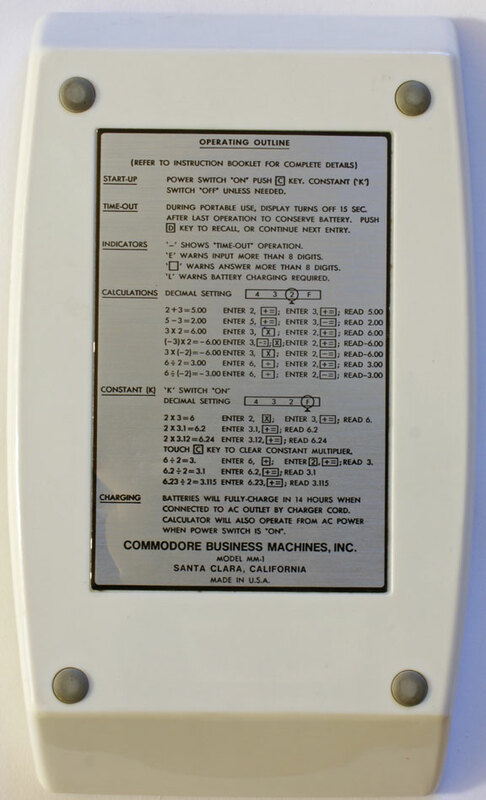 Stokes Publishing Company makes an overhead projector calculator with the same key functions. 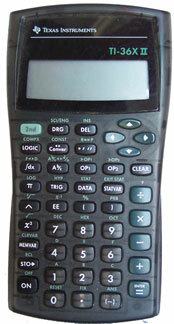 TI 36X II, advanced scientific calculator with two line display first introduced in 1999. This is a student donation. 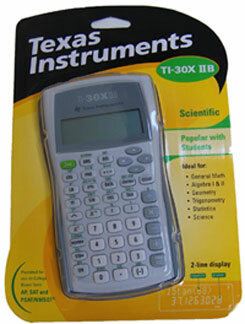 TI 30X IIb ,brand new in package, this was a 2004 birthday gift from students. Note the beautiful white, gray and green motiff (although it is not purple or lime green). 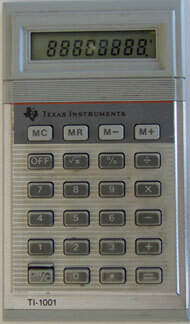 TI 81 with View Screen, the first Texas Instruments graphing calculator. According to datamath.org, it was first sold in 1990 for a price of $110. This is the earlier of two TI 81 designs. Mine was purchased on eBay on June 5, 2005 for $9.99 plus $8 shipping. 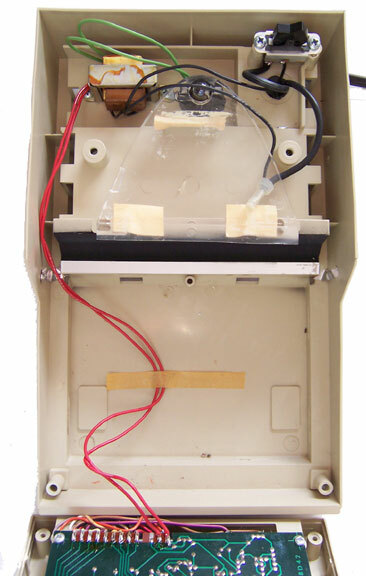 It is the overhead model with the calculator connected with ribbon cable to a glass viewing screen for use on an overhead projector. I believe it was orginally several hundered dollars with the viewing screen. Both the calculator and the screen are in good cosmetic and working condition except for identification markings from the school it was used at prior to being disposed of as surplus. It also came with a Poloroid magnifier to magnify the view screen image and a hard plastic case, padded inside, to store all the items. TI 83 Plus, popular graphing calculator purchased 2001 for about $100. The TI 83 has a Z80 family processor, like the Kaypro II computer. The combined RAM and ROM of TI 83 Plus is nearly ten times that of the Kaypro. 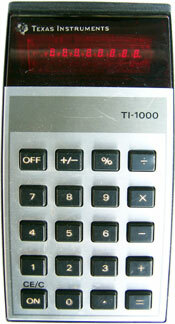 TI 1001, (1982) inexpensive ($9.99) LCD calculator with square root and memory. In good cosmetic and operating condition. As I recall, purchased on eBay. 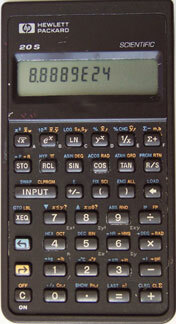 TI 7140, (1994) according to datamath.org this was the last TI calculator assembled in the USA, although of foreign and domestic components. Today, most calculators are made in China. 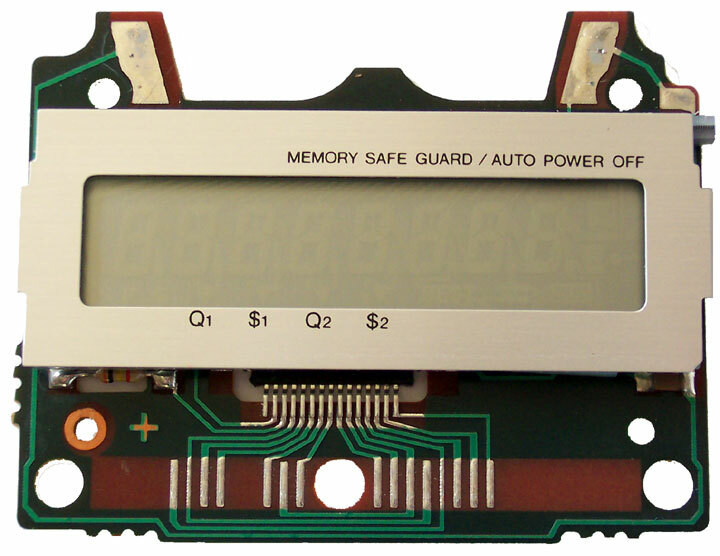 8 digit LCD display with solar power (no battery backup). Purchased at a garage sale for $.50 on 4-8-06. In good cosmetic and operating condition. 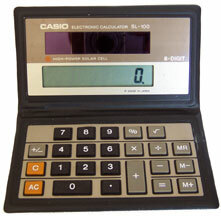 Comes with a grey plastic folding case which was directly attached to the calculator. The case is now torn off from the calculator. 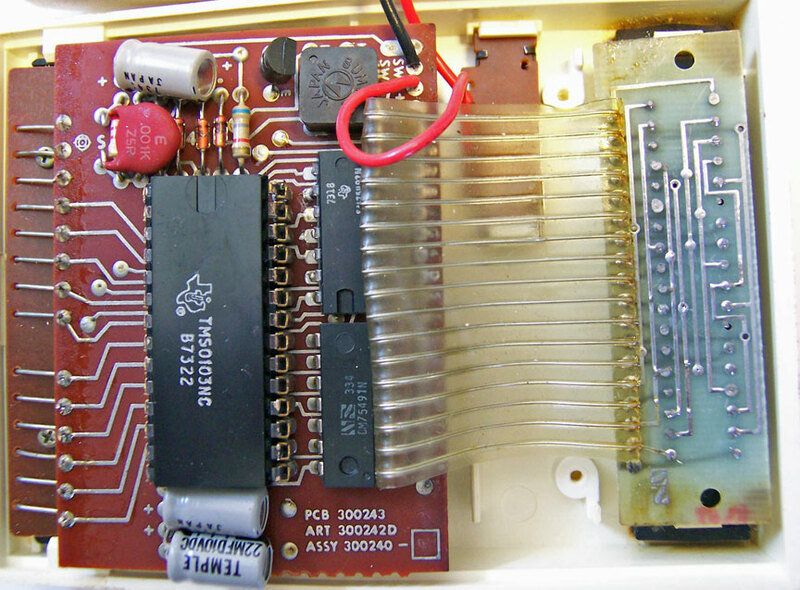 TI 5008, (1982) a small printing LCD calculator using thermal printing. 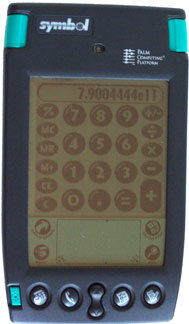 Date is from datamath.org which also indicates this is the second of two versions of the TI 5008. It represents quite a change from the Pocketronic 12 years earlier. In good working and cosmetic condition. The printing mechanism moves although I do not have a paper test to fully test it. Uses three AAA batteries. Purchased at a condo flea market on 4-8-06 for $1. Serial No. 438098. Made in Japan. TI 5008, (1984) a small printing LCD financial calculator using thermal printing. Similar to the TI 5008 above with some of the financial capabilities and styling of the TI BA35 above. Takes 4 AAA batteries. Small for a printing calculator at roughly 6" X 3" X 1". In very good cosmetic and working condition except the print is light (I assume the thermal paper is too old), the label on the back came off and is taped back on, and there are two velcro strips firmly attached to the back. Purchased on eBay on 5-9-06 for $16.26 plus $5.50 shipping. Came with 5.5" x 8" guidebook (150+ pages), quick reference manual and box. See datamath.org for more information. TI E.T. 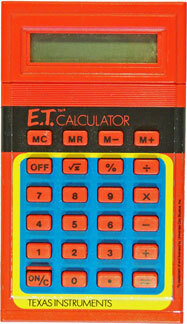 Calculator, (1982) similar to the TI 1030, 1031, and similar Slimline TI calculators, this one sports an E.T., the Extra-Terrestrial, motiff based on the 1982 blockbuster Steven Spielberg motion picture. (See Datamath.org). In that movie E.T. 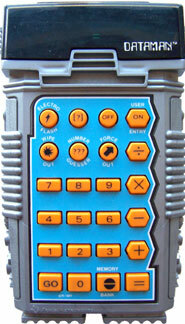 phones home using a modified TI Speak and Spell like the one in the prior section. (See Datamath.org - E.T..) Datamath.org also has photos of one in the original packaging and an internal view of the display. Mine was purchased on eBay and is in good working and cosmetic condition. 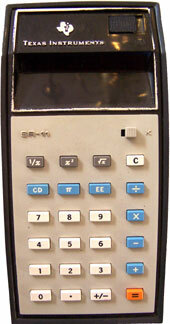 Sharp EL-805, released May 15, 1973, this is the first Sharp LCD calculator and one of the first LCD calculators ever. 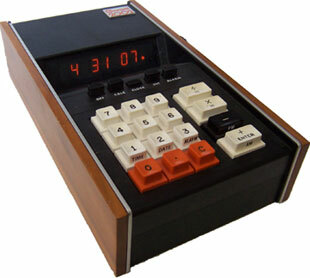 The first is the Lloyd's Accumatic 100, produced by Rockwell in 1972, according to Vintage Calculators. My Sears C1 appears to be a variant of the Accumatic 100. See www.dentaku-museum.com (in Japanese). 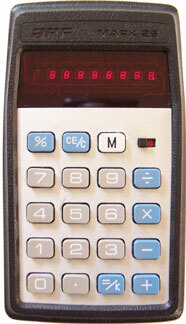 The EL-805 employed a crystal on substrate design with silver numbers against a black display. See additonal EL-805 pictures at datamath.org. The processor and LCD were on a single piece of glass. It used a tiny fraction of the energy of an LED calculator and could operate on a single AA battery for 100 hours. The back states it used .02 Watts which at the time was an amazing feat. Datamath (go to "calculators related to TI") states the price was $110, nearly $500 in 2005 dollars! 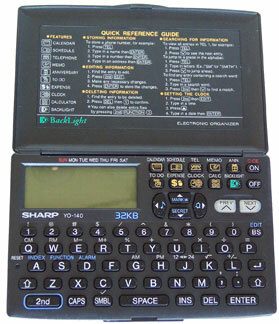 Sharp LCD Calculators and Vintage Calculators have excellent information about the history of Sharp LCD calculators. Wikipedia has information about LCD technology. Purchased on eBay on 11-27-05 for $26 with $6.50 shipping. Excellent working condition. (The display is fine. The photo is just fuzzy.) Excellent cosmetic condition except for light scratches on the back and a name and social security number lightly scratched onto the back. Soft case and instruction manual. Flip up cover over the display like the EL-808 below. Much smaller that the EL-808, with dimensions of approximately 8cm x 12cm x 2cm. 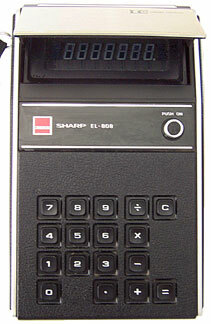 Sharp EL-808, circa 1973, early LCD calculator following the EL-805. Approx. 10.7cm x 17.7cm x 4.0cm. Pushing on botton causes metal plate over display to pop up blocking light from above while a window allows light to enter the top at a low angle to view the faint display. The Crystal on Substrate (COS) LCD display shows numbers in silver against black in contrast to black against silver today. Purchased on eBay on 7-7-05 for $9.99 plus $9.05 shipping and $1.30 insurance. Excellent cosmetic and working conditon with soft case. 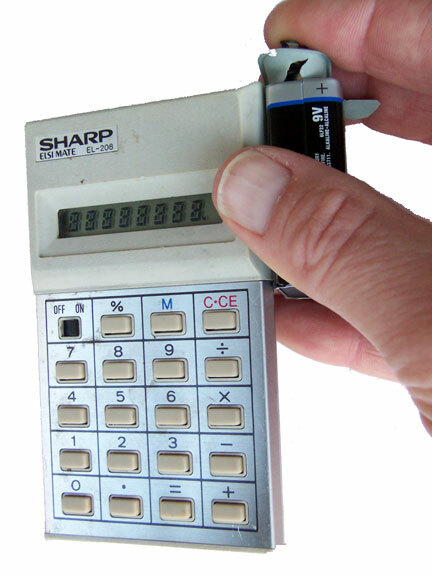 See: Sharp LCD Calculators, datamath (go to "calculators related to TI," scroll down to Sharp), datamath - additional pictures. 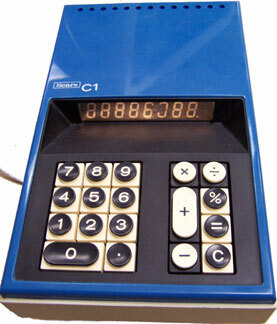 Sharp ELSI 8107, 1974 green fluorescent calculator. 3 AA Batteries or AC Adapter. Excellent working condition. This is the same model as the first calculator my family ever had in late 1974. While not rare, one site indicates it has a ceramic NEC CPU, unusual at the time. Sharp ELSI MATE EL-8109, circa 1975. Green fluorescent scientific calculator (lacks scientific notation, however). 4 AA 1.5 volt batteries, five 1.2 volt rechargable batteries or AC Adapter. Purchased on eBay about 2003. Very good working condition. For more information, see: Old Calculator Museum. Sharp ELSI MATE EL-5805, my first LCD calculator purchased in my junior year (1977-78) at UCSD for a statistics class. It has held up ever since that time. I recall it cost maybe $40. 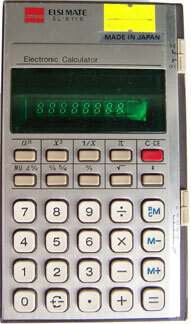 It replaced a broken Commodore LED scientific calculator purchased two years earlier. 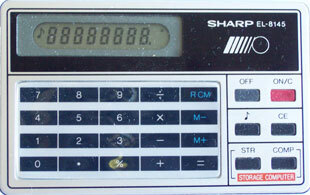 Sharp was a leader in LCD calculators with early models dating back to the early 1970s. See Sharp LCD Calculators. Sharp ELSI MATE EL-321 Shopping Calculator, allows you to set a budget and then deduct the cost of items you buy, alerting you when you are within 10% of your budget. Also compares unit costs for the best deal. Purchased with the EL-819. Like new condition. Wallet like case and instruction manual. Excellent working condition after a little tinkering and disassemby. It needed new batteries and one battery clip was not connected to the contacts below. The components are sandwiched together with no soldering. The display and the processor fall right out. The battery clip needed to make contact with this piece. Photo 1, Photo 2, Photo 3. The manual refers to the "rising cost of inflation" leading me to think it is from the late 1970s. Sharp ELSI MATE EL-819, small stylish LCD calculator with soft keys that only very slightly rise above the surface of the keypad. Tone sounds as each key is pressed. This feature is easily shut off with the musical note toggle key. Purchased on eBay on June 19, 2005 with three other calculators and a compact clock for $7.50 plus $5.60 shipping and insurance. It is in good cosmetic condition and excellent working condition. Comes in a wallet case which feels like leather on the outside. Math Venture Overhead Calculator, glass transparent overhead calculator purchased new on eBay on June 16, 2005 for $.99 plus $4.55 shipping, made in China by Stokes Publishing Company of Sunnyvale, California, emulating the Sharp EL-E300 calculator (right), copyright date 1994. Soft and hard case and instruction manual. Displays fractions as you would write them and switches from improper fractions, to mixed numbers to decimals. "EZ" function walks you through fraction operations doing neat things like prompting you for the least common denominator (LCD) when adding or subtracting fractions. Finds LCM or greatest common factor (GCF). Does scientific notation and simple statistics. In August 2005 I bought a case of 24 new ones for $25 and about $15 shipping. The total cost per calculator including tax was less than $1.75. Sharp EL-E300, circa 1994, same processor and functions as overhead calculator to the left. Very helpful with middle school math and displaying fractions. Purchased on eBay on June 22, 2005 for $3 with $5 shipping from Canada. In decent cosmetic and working condition except there is a column of pixels which is out and initially the "1" key did not work. I disassembled it and got the "1" key working. I then discovered that the mixed number key also does not work. Photos Showing EL E300 Disassembly. Sharp EL 501v, purchased new at Office Depot in August 2003 for $7, but after rebate it was free! I bought another one in July 2004 at Target for $2.98. 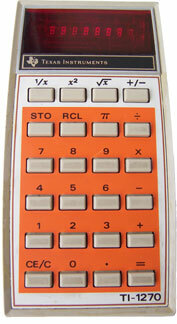 The calculator does everything a TI SR-50 did and more including conversions in different base systems. What a difference 30 years makes! 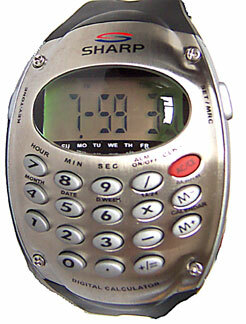 Sharp Calculator Watch, purchased new on eBay in March 2005 for $11. 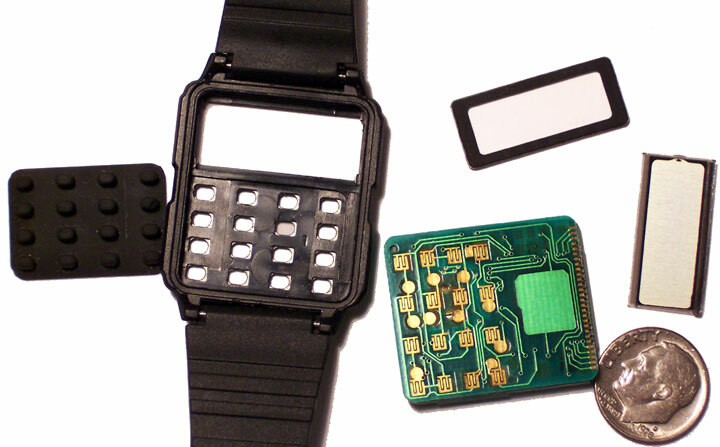 With the advent of LCD displays calculator watches were developed. I find them to be curious but not very practical since the buttons and display are so small it is difficult to use. They demonstrate that the size of calculators and computers is often not governed by the processor, but rather the human interface. 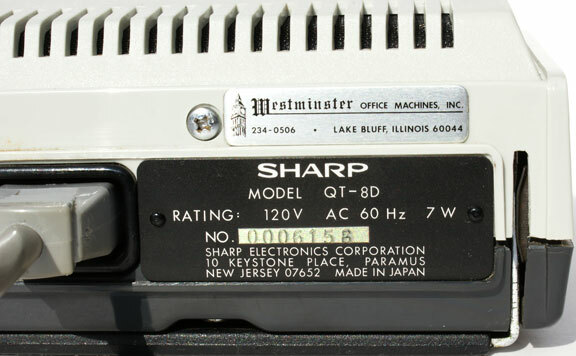 Sharp EL-509S, LCD scientific, one line display. Purchased for less than $1 around September 2005 at a garage sale. In excellent working and cosmetic condition. Relatively compact with typical scientific functions and wallet style case. Date is likely approximately 1986 since I found a book on the Internet called Conquering the Sciences, Applications for the Sharp EL-509S, with a publication date of 1986. Sharp EL-8118, semi-scientific (Pi, square root, reciprocal, squares, a to the n-th power, %, floating or fixed decimal and last entry), fluorescent display. Purchased on eBay on 11-11-05 in a lot of 24 calculators and organizers for $9.99 and $7.70 shipping. In good cosmetic and working condition. Takes two AA batteries. Battery compartment is clean. 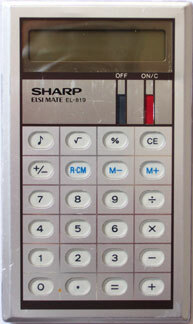 Sharp EL-208 (1979) a basic, solidly constructed, LCD calculator. It is unique because it takes a 9 volt battery, a very large power source for an LCD calculator. The space for the battery requires a large bulge on the back of the calculator as seen in this profile. Its power consumption at .038 Watts (the last digit is hard to read) is over 100 times more than the Sharp EL-230 to the right. It is still close to 10 times less than the EL-8118 above, however, which consumes .3 Watts. Purchased in the same lot as the EL-8118. It is in good cosmetic condition except for what looks to be some melted plastic on the back. It does not operate since one of the battery connections is corroded. However, I cut through the plastic on the connector and held the battery up to the back side of the connections. The calculator works fine doing that. (See photo) Installing a new 9 volt snap connector should therefore allow it to function like new. 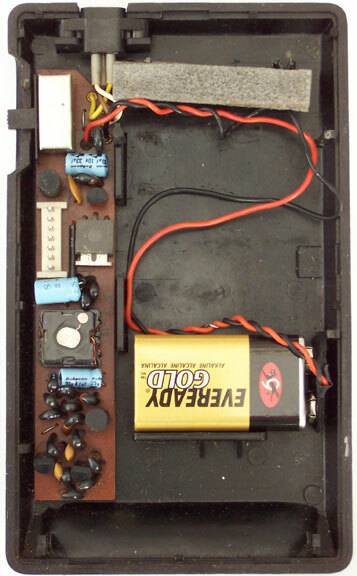 These sites comment on it noting its oversized battery: Sharp LCD Calculators, Dr. Briley, Univ. of Wisconsin, Oshkosh. 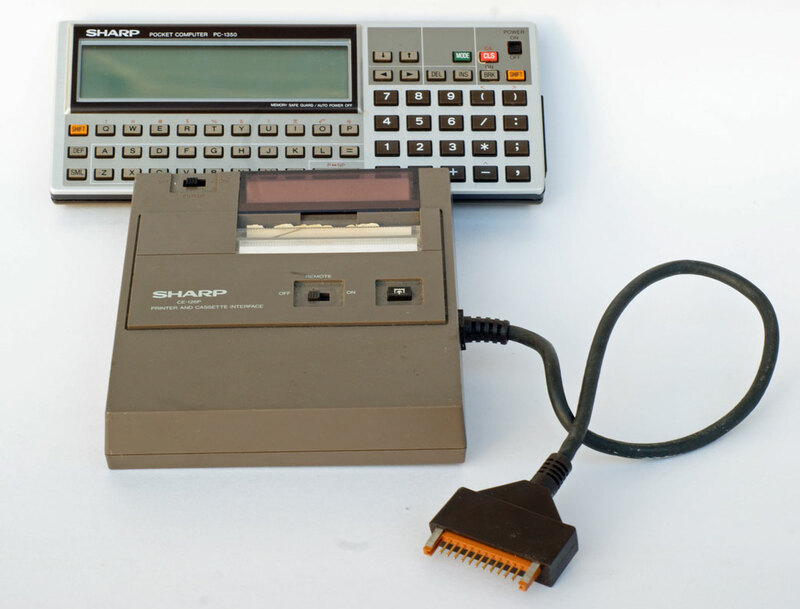 Sharp EL-230, LCD with basic functions including square root, % and a single memory. Purchsed in the same lot as the 8118 and 208. In good cosmetic and working conditon. Message #18 on this HP Museum Forum Archive 13 refers to the use of an EL-230 since 1981 giving a clue to the age of this model. The same comment praises the 230 for its solid construction, excellent battery life, and "really good" keys. Purchased in the same lot as the EL-8118. Sharp Electronic Organizer, an electronic organizer with calculator, schedule, telephone contacts, memo, to do list, expense record, and clock. This is model YO-140 with 32 KB. In good working condition. It takes three CR2032 three volt lithium batteries. I had to replace the original batteries. Unlike a calculator, at least one of these batteries draws some power all the time to keep the memory alive. That battery has a seal over it which says "Memory backup battery - Do not throw this seal away. Put back the seal after battery replacement." This organizer was one of about ten purchsed in the same lot referred to above. There are five more Sharp organizers and others from Rolodex (apparently made by Franklin), Royal, and Protege. Sharp still makes this type of organizer now with more memory. I'm guessing these are from the late 1990s. 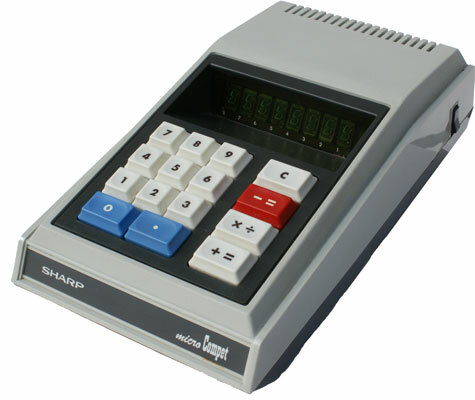 Sharp EL-203 (1977) a basic, solidly constructed, LCD calculator. 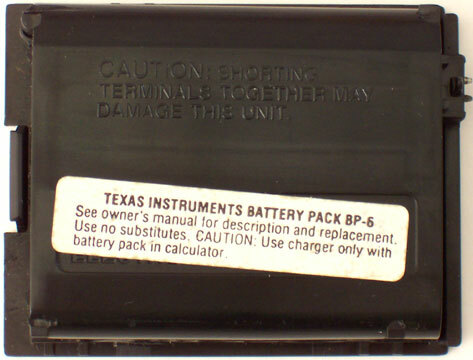 It, like the 208 above, is unique because it takes a 9 volt battery, a very large power source for an LCD calculator. Its power consumption at .025 Watts is somewhat less than the 208's .038 Watts. Includes square root and %. Single memory key. Ernst Mulder's Calculator Collection indicates the = key automatically adds results to the memory. In good cosmetic and working condition with the original manual in very good condition and original box in battered condition. Purchased on eBay on 2-4-06 for $1 with $5.05 shipping. 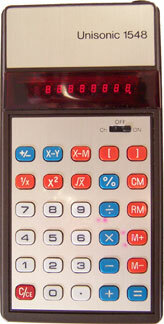 Sharp LCD Calculators indicates a 1977 date consistent with the higher numbered 208 being 1979. 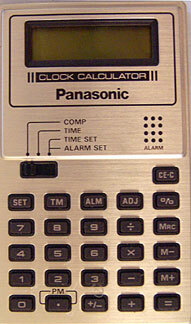 The Instruction manual has a date code of 1985, however, indicating that perhaps the calculator was sold for a long time. Also, Vintage Calculators lists it as having a yellow screen, while mine does not have the yellow filter indicating the calculator may have changed slightly over time. Sharp EL-502, scientific flourescent 8 digit calculator. Long and narrow (6.5cm wide, 14.5cm long, 2.1 cm thick) with only 24 keys. 9 volt battery. No AC option. .2W. Serial No. 82172358. I could not find any information on it. I removed the back, but could not view the front of the circuit board. 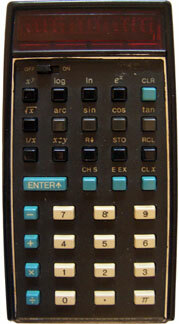 John Wolff's Web Museum has a Sharp EL-501 scientific calculator, with fluorescent display, dated 1977. I assume the EL-502 was around this time. I assume it wasn't much beyond this time, however, since my EL-5805 LCD scientific calculator, with statistical and other features not present in the EL-502, came out in 1977. 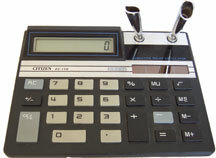 I purchased the EL-502 on 2-21-06 on eBay for $5 with $5 shipping along with two other calculators. The EL-502 is in good working and cosmetic condition. There is a name scratched lightly on the front. It comes with the original, although tattered, box. 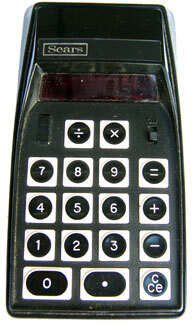 Sharp EL-8145, (1978) credit card sized calculator. Date from Sharp LCD Calculators which indicates it is only 3.5mm thick. Has tone when keys are depressed. This can be shut off. In excellent working and cosmetic condition. Made in Japan. Metal case. Serial No. 87354409. Two "G8" silver oxide batteries. Power 0.0002W. Purchased on eBay on 3-4-06 for $5.99 with $4.10 shipping. 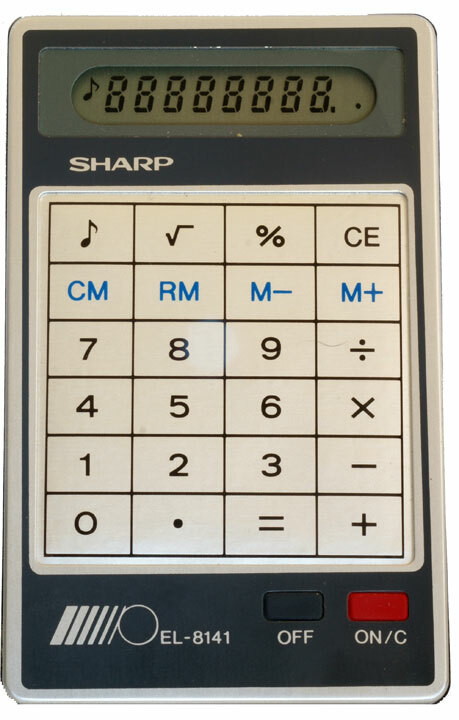 Sharp EL-506H (1981) LCD scientific calculator. Date is from this Japanese site which indicates it has 48 functions. Includes hexadecimal conversions and statistics. In excellent cosmetic and operating condition. Made in Japan. 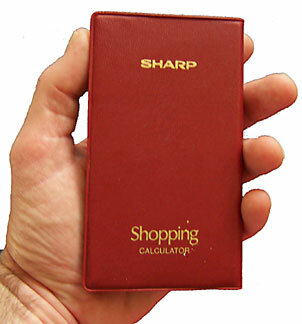 Sharp EL-8141 (1978) (Large Image) small, vertical oriented, credit card sized calculator. Memory, square root and a musical tone which you can turn on or off. Takes two G8 silver oxide batteries (each 1.5 volt). I tried it with two LR1130 1.5 volt alkaline cells which worked but seemed a little thick. Consumes 0.0002 Watts. Made in Japan. Date is from HP Forum Archive 15 - Message #7. In excellent working and cosmetic condition. I think I got it at a La Mesa, CA garage sale in 2008 for $1 or $2. 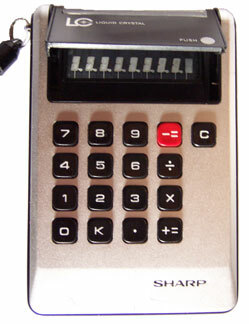 Sharp Pocket Computer PC-1350 (1984) (Large Image, With Printer) pocket computer calculator. 150 x 32 pixel LCD display. Standard 4 KB RAM. Expansion RAM card with own battery available. Superseded in 1987 by the Sharp PC-1360 (see Tony's Calculator Collection) with one additional RAM port, faster CPU and ability to attach a floppy drive to it. Takes two CR-2032 batteries. Basic programming built in. According to Promsoft the last suggested retail price (1991) was $249 or close to $400 in 2009 dollars. The price was therefore similar to a netbook computer today. An emulator is available at Pocket Computer Museum. A number of sites have extensive information including: Wikipedia, Pocket Computer Museum, Calculators - Pocket Computers - Sharp PC-1350, R/S Sharp PC-1350, and The Handheld Computer. I got mine for, as I recall, $5 at an estate sale in La Mesa, CA on 2-13-10. It came with the printer. I bought several other electronic items including two laptop computers and a Toshiba Libertto 100CT and 50CT which are very small general purpose computers and hence will be in the computer museum. The items belonged to the seller's father who was a nuclear engineer for the Navy. The computer and printer are in good cosmetic condition. I still need to dig up some batteries to try them out. 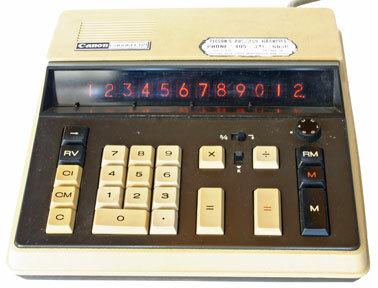 Casio AS-8D, (May 1972 Japan) early portable flourescent desktop calculator running on 6 C batteries or AC (cord missing). 4 basic operations only. =+ and =- keys. Floating and fixed (0, 2 or 4) decimal. Constant switch. Battery level gauge. Zero displays half height. Calculations slow. Dimensions: about 22cm x 14cm x 6cmFunky Goods, in Japanese, has excellent external and internal photographs. Google has a literal translation, Funky Goods English. Introduced the same year as the TI 3000, TI 3500 and Garrett 2002. Purchased on eBay in about 2004. Battery contacts have corrossion, but after sanding the calculator works. Cosmetic conditon is good. 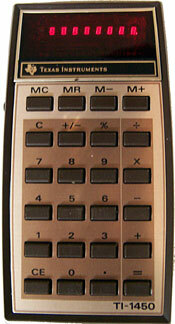 Casio Memory 8R, (1975 Japan) horizontal design, purchased on eBay on 5-22-05 for $2 ($3.50 shipping). Keys and logic in good working condition. Power works sometimes with the AC adapter but the wire at the adapter is loose. The adapter can't be opened. The calculator takes two AA batteries. The connection with the + end of the battery is a problem. It works intermittently by placing aluminum foil at the contact and the two silver areas above it. See lower left of board in interior view 1 revealed when you remove back plastic cover. 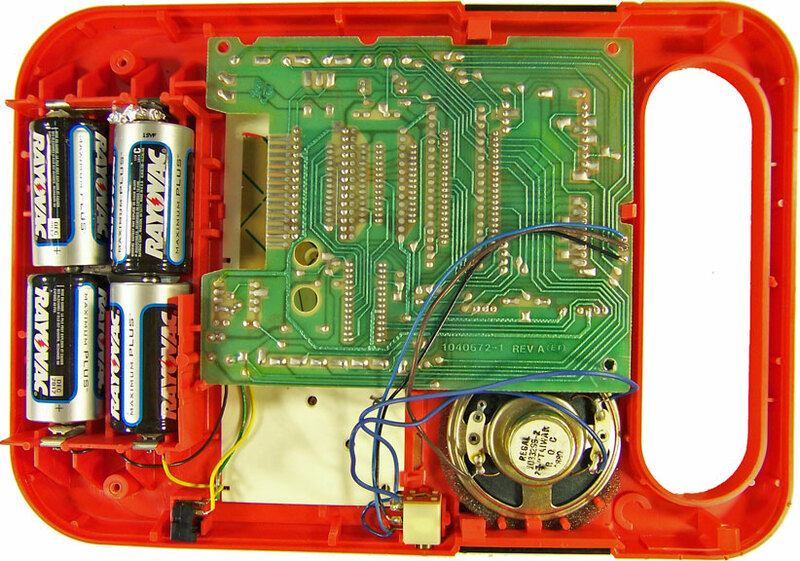 Folding that board up reveals interior view 2, showing the main circuit board connected by 12 wires to the board with the keys. Interior view 3 shows the main circuit board. Find comprehensive information at Vintage Technology. I purchased a second one on eBay in very good cosmetic and working condition on 3-2-06 for $2.50 plus $5 shipping. 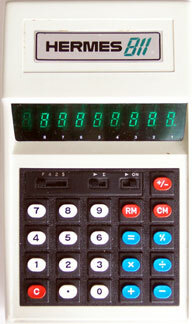 Casio Personal I, (1976 Japan) 8 digit flourcent display. In good working condition with either included AC adapter or two AA batteries. Purchased at La Mesa garage sale on October 8, 2005 for $2. More at Vintage Technology. Casio SL-100 Folding LCD Calculator, purchased at garage sale July 2004 for $1. Folding gives compact size, but large display. Casio fx-115v "Super-FX", scientific calculator purchased at Costco in the late '80s or early '90s for my wife. See Casio History for history of Casio. Casio fx-7000G, (October 1985 Japan) the world's first graphing calculator. Excellent information at datamath.com (go to calculators ralated to TI). Purchased on eBay on $4.99 plus $2.75 shipping on 11-13-05. Comes with 158 page owner's manual and 192 page Computing with the Scientific Calculator. In fair cosmetic condition with some scratches on the screen and dents on the back. In good operating condition after replacing the three 3V batteries. Replaced thinner CR2025 with CR2032 specified in the manual. 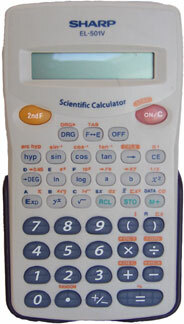 Casio fx-260 Solar Fraction, one line LCD solar scientific calculator with fraction capabilities. Purchased at garage sale in May 2005 for $3. In good cosmetic and working condition. From mid to late 1990s. Made in Malaysia. 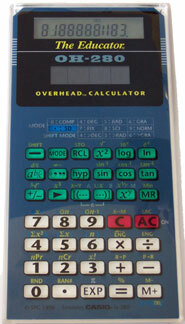 Casio OH-260 Solar Overhead Calculator, for use with overhead projector. Manufactured by Stokes Publishing Company. Emulates Casio 280. Copyright 1996. Made in China. It is in good cosmetic condition. Not working correctly. At first the "one" key would not work. Now there are multiple problems including problems with the display (photo is suppose to have all 8s) and multiple keys which do not work. I purchased it on eBay for $12.50 with $5.85 shipping. The seller refunded all the money, however. It makes a nice display piece and a mystery! Casio fx 115ms, purchased new in 2004. For about $15 you get an advanced scientific calculator that solves algebraic equations, although you have to have a student remind you how to set it up. 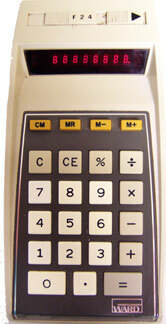 Casio Mini CM-605, (1974) part of the series of Casio Mini calculators with a horizontal design, the first introduced in 1972. Flourescent 6 digit display, although another six digits can be viewed by holding down the arrow key. 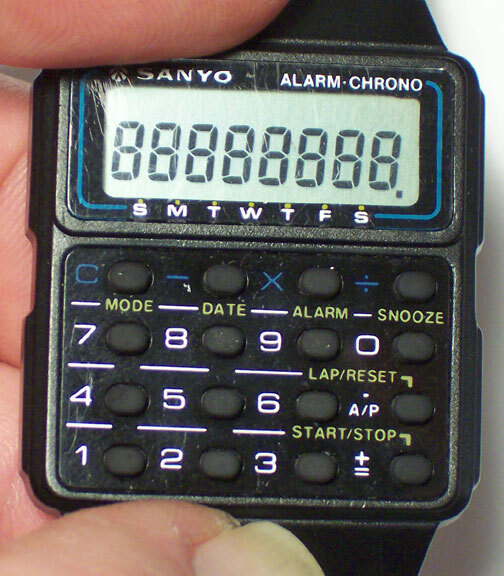 The six digit display was a cost saving mechanism in the early days of pocket calculators. Half height zero as in the AS-8D. Uses 4 AA batteries. Additional information at: Ernst Mulder's Calculator collection and Vintage Technology. An interesting essay about the importance of the rapid rise of calculators, including a discussion of the CM-605 as the author's first calculator, is at a new site, calculator.org. That site also has an online java script scientific calculator, a free downloadable calculator for your computer, and a more advanced downloadable calculator for $11.85. 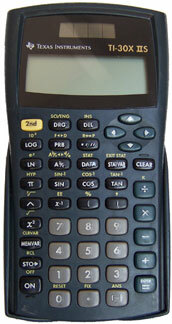 A CM-605 is for sale for $39.95 at R/S Calculators. My CM-605 was purchased on eBay on 3-4-06 for $9.99 with 4.05 shipping with the box and AC adapter. It is in very good cosmetic and working condition. 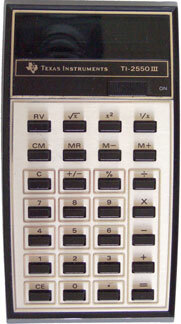 Casio Personal Mini CM-607, (May 1975) Large image. 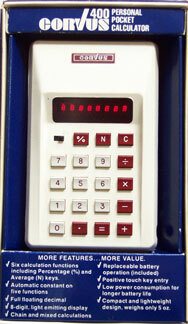 Another in the series of Casio Mini calculators with a horizontal design, the first introduced in 1972. Flourescent 6 digit display, although another six digits can be viewed by holding down the arrow key. Half height zero as in the AS-8D and CM-605. Uses 2 AA batteries. .2Watts power. Uses adapter AD-2S. Made in Japan. Purchased on eBay on 2-10-06 for $5.99 with $5.15 shipping. In good cosmetic and working condition. Several sites discuss it: Manual, Old Casio Calculators, Vintage Calculators - Casio Mini Series, Casio Personal Mini - Voidware. Vintage Technology notes some interesting quirks. First, the information panel on the back is upside down compared to the front. Second, if you divide by zero the display shows 000000, but if you press the arrow key to see the other digits the calculator keeps calculating away! 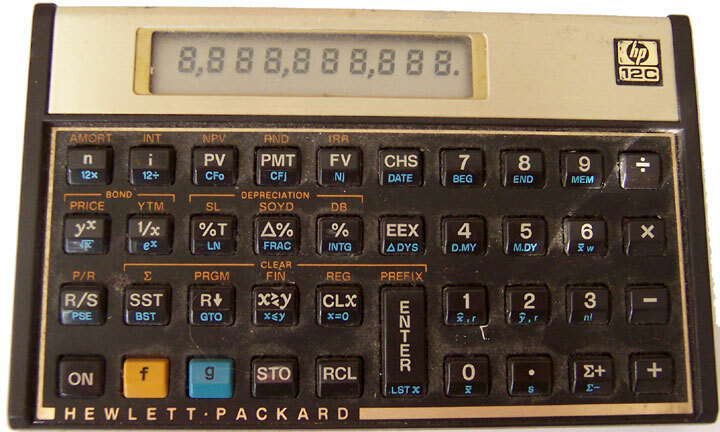 Hewlett Packard 35, (1972-1975) this historic model was the first scientific pocket calculator and signaled HP as an innovator in calculator design. It sold for $395, over $1,800 in 2006 dollars. 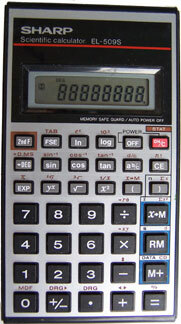 Like many HP calculators the HP 35 uses Reverse Polish Notation (RPN). With RPN you first enter the number and then tell the calculator what to do with it. According to an HP article on RPN, RPN has several advantages over typical algebraic entry including showing intermediate answers and using fewer keystrokes. HP says it's easy, and now even has a virtual RPN calculator at the above link to try it out. Made in USA. Mine appears to be the third of four versions of the HP 35. Over 300,000 were sold, vastly exceeding expectations. The HP 35 signaled the death of the slide rule. 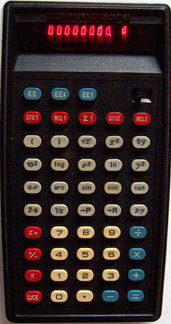 The TI 50 eventually competed with it with a significantly lower price but without the RPN preferred by many. Mine was purchased for $45 with $5 shipping in February 2006 on eBay. That's expensive, but HP calcualtors, both used and new, tend to be expensive. The description said it works, but it did not come with batteries or a charger to test it. I had an HP charger (82026A) from a garage sale ($1) that I thought would work, but it has a slightly different two hole connection while the HP 35 calculator has three pins. After some experimenting I got it to work with three 1.2 volt NI-MH rechargeable batteries taped together with Aluminum foil to join negative and positive terminals and speaker wire to hook the battery terminials to the calculator terminals (upper one went to negative battery terminal). This closely approximates the 3.5 volts of the original battery pack. (I did not do this for long and I don't know if this can cause injury or damage, so don't necessarily do what I did!) With this arrangement you, of course, must charge the batteries outside the calculator in an appropriate battery charger. 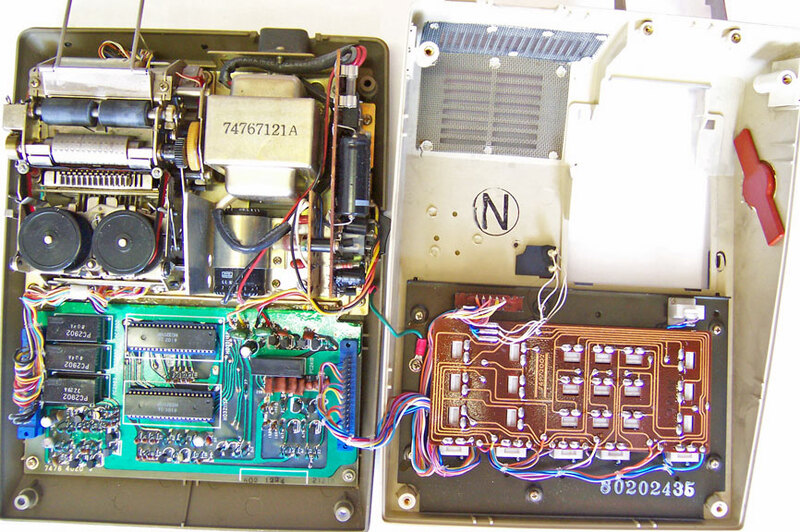 There is excellent information on the HP 35 at several sites including HP site, Museum of HP Calculators, Museum of HP Calculators Simulation, Wikipedia, Vintage Calculators, Making New Battery Packs for the HP 35 Calculator, Educalc.net (exploded view), HP Calculator History - Trascendental Functions, Datamath.org - Internal View HP 35. Hewlett Packard 17b, financial calculator that belonged to my father-in-law. 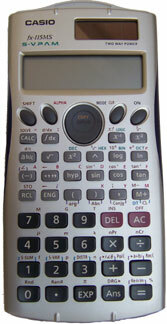 HP 95LX, not only has financial, scientific and graphing calculator capabilities, but also has built in text editing, a Lotus 123 spreadsheet and appointment calendar. You can write or load your own programs. Indeed, it has the power of the original IBM PC all in a package the size of a large calculator. 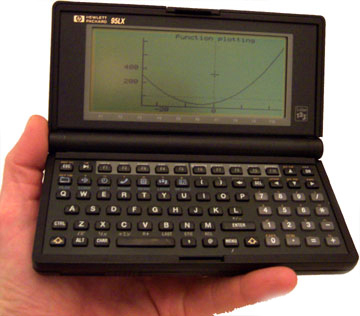 It was HP's first palmtop personal computer. Since it is really a general purpose computer, it is discussed further in the computer museum. (Large photo. 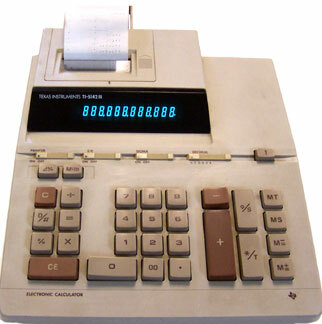 )HP 12c, financial calculator using Reverse Polish Notation (RPN). First introduced in 1981, the HP 12c is still sold today! According to ajc.com/business (Atlantic Journal-Constitution), HP claims it is the oldest consumer electronic device still made. The new on-line price at hp.com is $69.99. With RPN, you add 2 + 3 with the following keystrokes: 2 Enter 3 + . This takes getting use to. hp.com has considerable information availble including features and specifications, and the 211 page manual. 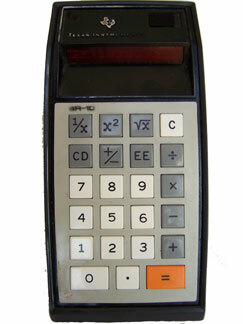 See also Museum of HP Calculators. Purchased at a garage sale 9-10-05 for $.25. Good cosmetic and excellent working condition. No case or manual. USA stamped on the back with serial number 2902A32194. The 12c has been made in other countries but apparently the USA ones are the most valued. 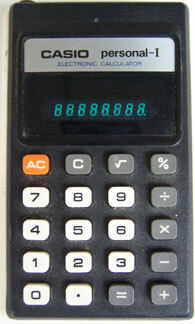 (See Museum of HP Calculators). If anyone knows the approximate date of manufacture of my calculator, please e-mail me. 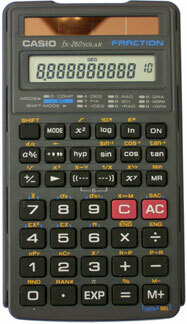 HP 20s, (1989) solidly made non-RPN scientific calculator programmable by entering the key strokes. It has customary-metric conversions, base conversions, and a program library of frequently used functions. The hp.com site has a list of features. Mine was purchased on eBay on 7-31-05 for $13.03 plus $3.44 shipping. It is in good working condition. The cosmetic condition is good except for a dent in the metal around the display. 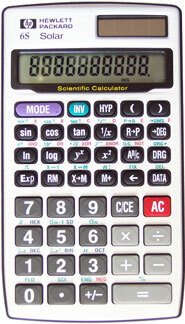 HP 6c, basic non-RPN scientifc calculator introduced in 1999. It is compact and well constructed with a metal case, although some complain that the keyboard is spongy. Purchased new on e-Bay on 8-15-05 for $5.24 with free shipping. The hp.com site has the manual. 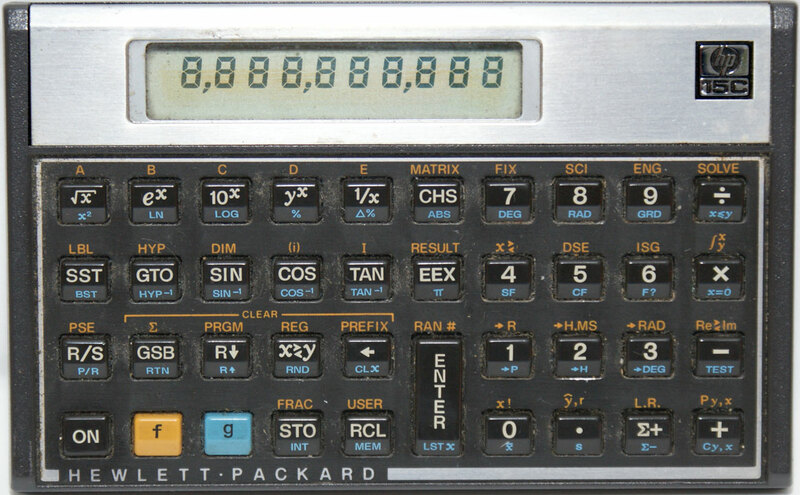 Hewlett Packard 15C (1982-1989) (Large Image) Advanced programmable scientific calculator using Reverse Polish Notation. 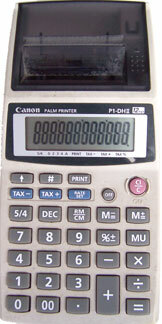 It shares a similar design with the HP 12C financial calculator above. 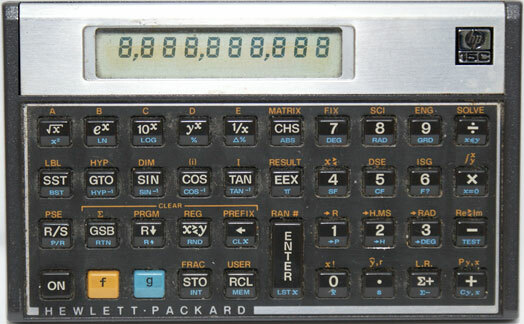 Both are part of the HP 10C series which included the HP 10C basic scientific calculator, HP 11C mid-range scientific calculator, HP 12C financial calculator, HP 15C advanced scientific calculator and the HP 16C computer programmer calculator. (HP 10C Series - Wikipedia.) 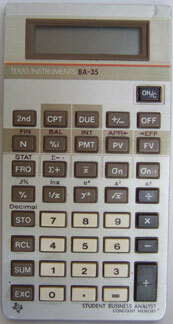 The HP 15C was made from 1982 to 1989. It originally cost $135. That's about $315 in 2011 dollars - the price of a discount laptop computer. (For example, on the day I bought my HP 15C my local Radio Shack had a laptop computer on sale for $300.) While the HP 15C hasn't been made for over 20 years, it still has a following. Bring Back the HP 15C seeks to have HP resume production. 14,847 people in 175 countries have signed a petition stating they would buy 83,363 HP 15c calculators. (Curiously, that's an average of 5.6 calculators per person.) 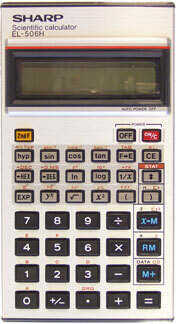 That site states the HP 15C is the best scientific calculator ever made by anyone for everyday use. Reasons: It uses Reverse Polish Notation (RPN) which is more efficient and natural, it was the smallest RPN calculator made by HP, the keyboard feel is very close to perfect, the landscape keyboard layout where you press keys with your two thumbs is better than a portrait layout where you press keys with one index finger, it has great battery life, the owner's manual is top notch, and it is the coolest looking calculator ever made! HP 10c Series - Wikipedia states it sells used for between $200 and $400. On the day I bought mine (July 23, 2011), one sold on eBay for $419! The range on eBay for about the past 15 days was from $92 to $600 with 25 of them sold. I bought mine at a garage sale in the San Carlos area of San Diego for $1.00! It is in good working and cosmetic condition. It was pretty dusty with some yellowing of the covering over the screen. It works fine, however. It did not come with the cover or manual. There are computer simulators at Hewlett Packard 15C - A Simulator for Windows, Linux and Mac OSX and at hp15c.com. As explained at hpmuseum.org the HP 15C supports a lot of advanced math including complex numbers, matrix math and many things beyond my comprehension! It uses three 1.5 volt LR44, S76 or similar button cell batteries which are readily available today. UPDATE: I was looking at amazon.com on 9-16-11 and noticed that HP now does sell a new edition of the HP 15c for $99. It's the same as the old one but up to 100X faster. Pretty cool - an electronic product being reintroduced after 22 years! The petition referred to above apparently worked! Congratulations. 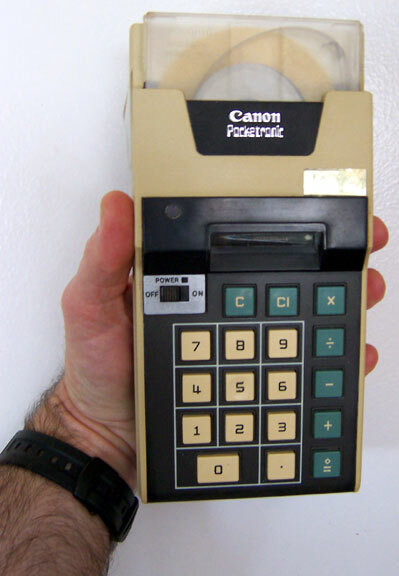 Canon Pocketronic, truly historic, the Pocketronic was the first pocket calculator. (For big pockets or hands - it's about 8" x 4" x 2".) It is a direct product of Texas Instrument's "Cal-Tech" project. The Cal-Tech (i.e. calculator technology) project set out in 1965 to use integrated circuits to build a calculator that could fit in one's hand. The project was completed in 1967 with several working prototypes. Texas Instruments sought out a manufacturer and Canon, noted for its cameras, was interested to increase it business machine business. The result was the Canon Pocketronic released in Japan in April 1970. (I was in 7th grade.) 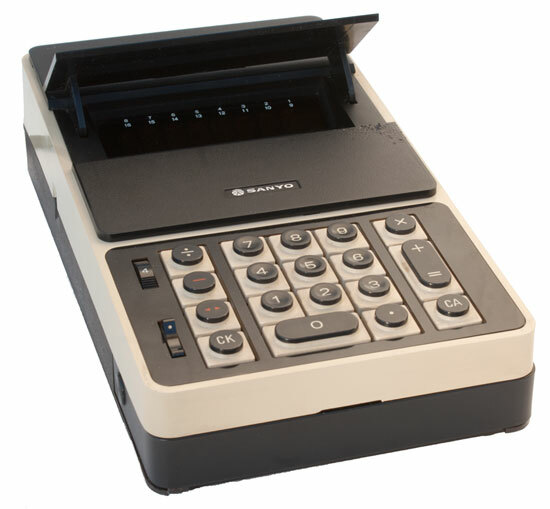 It is very similar to the Texas Instruments prototypes including having a horizontal paper printout. It has no LED, LCD or other display - just the printout. It is powered by 13 rechargeable Ni-Cad batteries. It originally sold for $395, over $1,950 in today's dollars! The Cal-Tech program is discussed at the datamath site. On the left menu, click "History" and then "Datamath story". The datamath site also has a good article on the Canon Pocketronic which it describes as "the most important calculator in the history of Texas Instruments." On the main menu, go to "Calculators related to Texas Instruments," then to "Canon," then to the "Pocketronic." The datamath site also has several additional pictures. 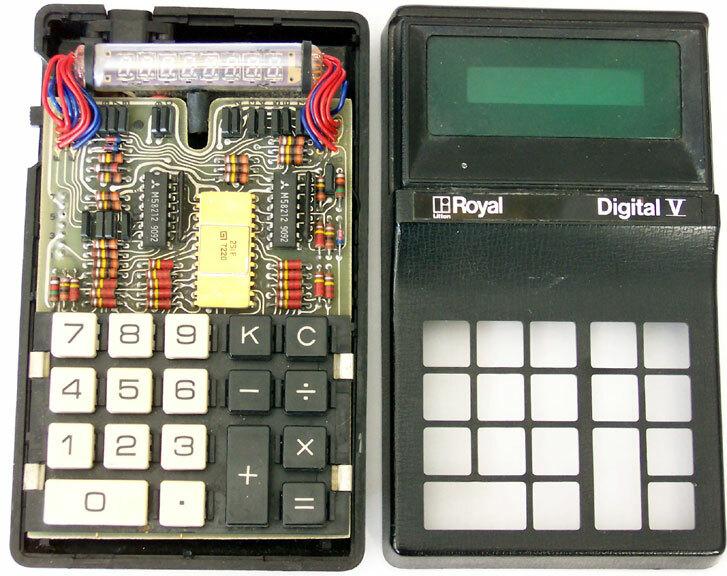 Vintage Calculators also has an excellent article on the Pocketronic and the Cal Tech project. See also Old Calculator Museum. Instructions. My Pocketronic was purchased on e-Bay on May 26, 2005 for $42, with $12 shipping and insurance. It is in good cosmetic condition, but does not have the charger and therefore I do not know if it works. I assume the Ni-Cad batteries no longer function. Serial no. 406747. It has an "Export Inspected by Canon, Tokyo" tag on the front. Canon Canola L121 (circa 1971) (large image) www.datamath.org states the first desktop calculator using Large Scale Integrated (LSI) circuits. According to Wikipedia an integrated circuit is a miniaturized electronic circuit etched onto a semiconductor material such as silicon. A large scale integrated circuit has tens of thousands transistors per chip. (See also webopedia.) Describing the L121 as a breakthrough in technology, www.datamath.org has photos and descriptions of the four main integrated circuits in the L121. The L121's display used Nixie tubes which are sort of like vacuum tubes with 10 layers inside, each representing one of the numerals 0-9. (See Wikipedia.) After this time, Nixie tubes were rapidly replaced by orange Panaplex displays by Burroughs which appear to be like flat Nixie tubes, Light Emitting Diodes (LED), Vacuum-Fluorescent-Displays (VFD), and Liquid Crystal Displays (LCD). Each used progressively less power allowing more pocket sized devices. 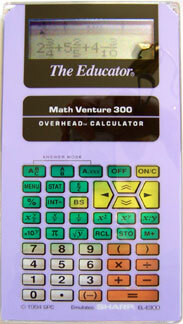 (See Datamath's Display Technology of TI Calculators). The Old Calculator Web Museum has a detailed discussion of the L121 including how the calculator sparked the interest of that Web site's author as a youngster in an eventual career in computer science. I myself acquired an L121 because it reminded me of the electronic desktop calculator that was demonstrated by a speaker in my 8th grade math class. As indicated before, I was amazed at what the machine could do. I have no recollection of what brand or model of calculator it was, but it would have been the same vintage as an L121. John Wolf's Web Museum has an excellent display of early Canon desktop calculators including the L121. Be Calc has some excellent close-up photos the L121 components. It lists a date of 1970, a year earlier than other sites. Classroom Tech shows a somewhat similar Monroe 620 made by Canon. I purchased my L121 on eBay on 6-16-06 for $9.99 plus $16.25 shipping from Oklahoma. It is in good working and operating condition with a cover and power cord. 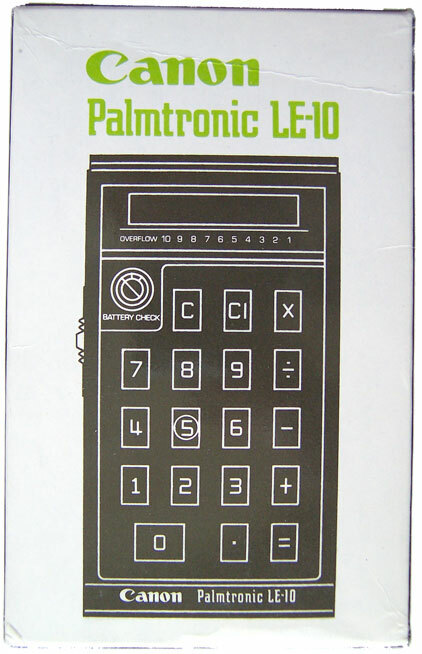 Canon Palmtronic LE-10 (January 1972) Canon's first LED display pocket calculator, following the Bowmar 901B introduced September 1971 by only a few months. Datamath.org states the original price was $259 or over $1,250 in 2006 dollars! It is a very solid machine with a very clear LED screen and ten digits. It runs on either a NiCad battery pack or four AA batteries which fit into a removable holder. It has an analog battery meter. To charge the NiCad Battery pack you fit the calculator on a cradle apparently attaching it with a screw that fits in a screw mount on the calculator. The screw mount happens to be the same size as a tripod mount; hence, it's the only calculator I know that mounts to a tripod! I purchased this on eBay on 6-13-06 for $15.75 with $5 shipping - a great deal! It is in near new cosmetic condition and operates perfectly. It includes the original (box), manual and cover, all in excellent condition. It also comes with a battery holder for AA batteries as well as a NiCad battery pack. Both the holder and the separate NiCad pack look new with absolutely no corrosion. It did not include the cradle for charging and AC operation, however. Datamath.org has some excellent photos of the charging craddle and internal views of the calculator. 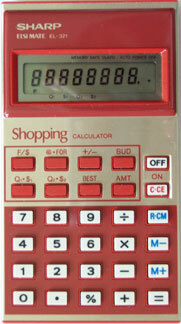 While made in Japan, the calculator uses Texas Instruments chips and display modules. 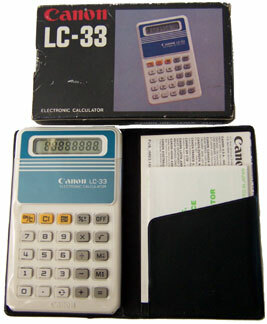 Canon LC-33, (1982) a small LCD calculator, purchased on eBay on May 13, 2005 for $1.53 with $4.50 shipping, in very good working and cosmetic condition with box and paperwork. Datamath says it uses a unique design with a "flexible foil pressed against a heavy metal sheet" avoiding solder joints. See datamath internal photos. Canon Palm Printer P1-DHII, battery operated, 12 digit LCD display, printing calculator, purchased at a garage sale in the Clairmont area of San Diego around September 2005 for about $1. In good cosmetic and operating condition although it does not have the paper tape to determine the quality of the print. It is apparently a current model selling through amazon.com for about $20 - quite a change from the Pocketronic price tag of $395 in 1970. 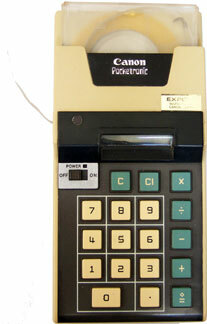 Canon Palmtronic LE-83, (1974) very solid and stylish 8 digit LED calcuator. Simple four functions. 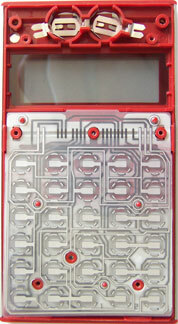 Top front slides open for the four AA batteries. .5W power. Made in Japan. Datamath.org states price was $44.95, the first Canon calculator under $50. Datamath also has an internal view. It has an Export sticker on the side. Purchased on eBay on 3-01-05 for $1.95 with $4.50 shipping. Includes case. Seller was nice enough to include 4 new batteries. Serial No. appears to be 653129 although it is hard to read. In near new cosmetic and working condition although front label is bubbled. 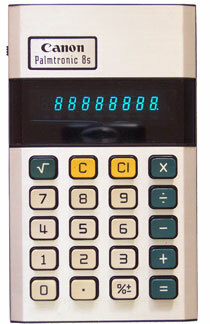 Canon Palmtronic 8s, (1977) a very thin and stylish fluorescent display calculator. By this time LCD calculators were generally taking over. Excellent description and internal view at Vintage Technology and Datamath. Purchased on eBay on 5-6-06 for $1.99 plus $2 shipping. In excellent cosmetic and working condition with case and instructions. Uses two AAA batteries. Serial No. 764763. Uses 0.2 Watts power. 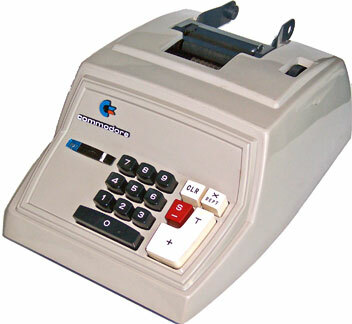 Commodore, a U.S. company, sold adding machines in the late 1960s and sold the Commodore C110, a rebranded Bowmar, by late 1971 or 1972. 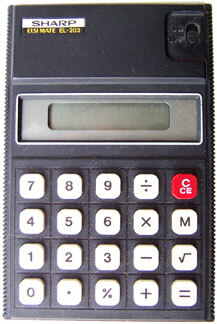 They then starting making their own calculators in the US, UK, Japan and Hong Kong. In 1976 they bought chip manufacturer MOS Technologies Inc., whose chips were used in Apple II, Attari 800 and Commodore PET and 64 computers. 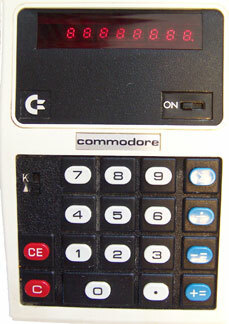 By the late 1970s Commodore got out of the unprofitable calculator market to concentrate on computers, a market which itself became unprofitable for Commodore and others. 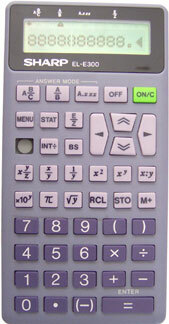 As indicated previously, my first scientific calculator was a Commodore, I believe Model No. SR4148R discussed at Vintage Technology. Commodore 207 adding machine, made in Japan. Commodore originally sold typewriters then adding machines. They began importing their adding machines from Japan by 1965. By the early 1970s they concentrated on electronic calculators instead. This machine therefore dates from about 1965 to 1970. Compared to a pocket calculator it is huge - about 5.5" x 7.5" x 11" and weighing over ten pounds. It really only adds and subtracts, although it has a X key for repeat addition. Purchased at a yard sale in the Clairemont area of San Diego on 4-29-06 for $.50. It appears to be in good working condition although I have not tried it out with a tape and new ribbon. The cover comes off by moving two tabs at the bottom. See Internal View. 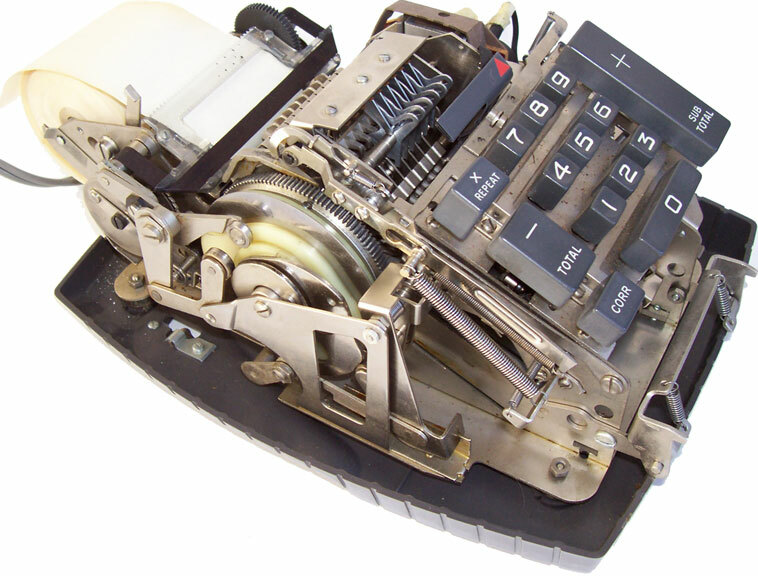 It is a mechanical calculator utilizing the same basic technology as the Dalton adding machine below from the 1920s or before. The mechanics are powered by electricity. Commodore Minuteman 1 (Large Image) Also known as Model MM-1, the Minuteman 1 was introduced in January 1972. 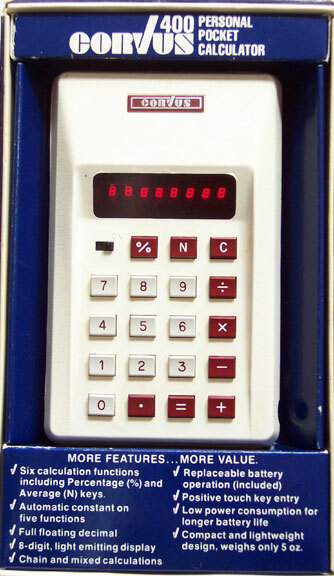 This was among the earliest pocket calculators with the Canon Pocketronic being introduced in Japan in April 1970 and the Bomar 901B and similar Commodore C110 being introduced in September 1971. History of Calculators - Timeline. See also Timeline, datamath.org, and Commodore Calculators. Relatively large at roughly 6 x 3.5 x 1.5 inches. Klixon keyboard. The calculator pulls apart - one half is the battery back, the other half is the calculator. 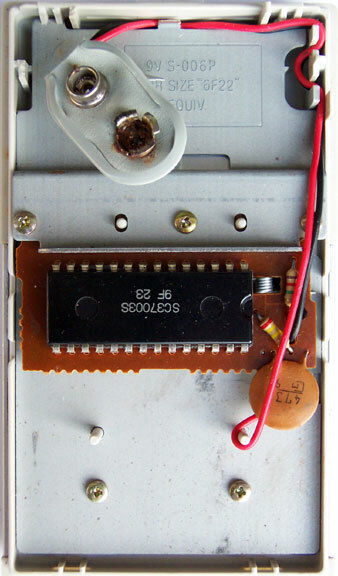 Two pins in the "Power Pak" section fit into two holes in the metal plate of the calculator section. 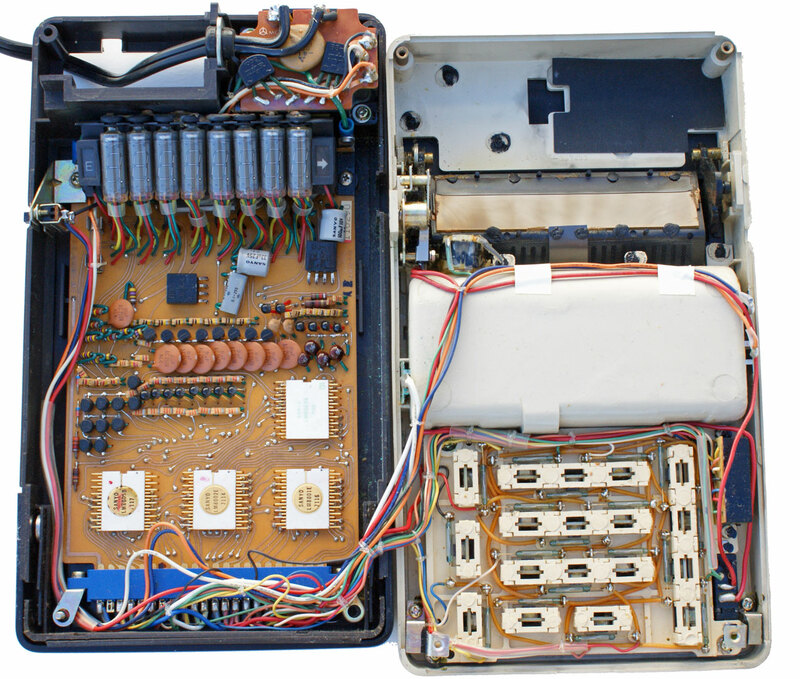 The electrical connection is made at the top with two pins in the calculator section fitting into two holes in the "Power Pak" section. (Half Sections) Red 8 digit LED display. There are no tops on the number 6, but unlike the Commodore Minuteman 2 below, it does have full height zeros. Made in USA by Commodore, Santa Clara, California. Serial No. 19197. Four basic functions only with += and -= keys. Mine was generously donated to me in March 2009 from a man in Ontario, New York. The six NiCad batteries do not appear to have leaked, but I assume they no longer hold a charge after nearly 40 years. It is in excellent cosmetic condition. It works with the included AC adapter. The only problem is one of the seven segments in the far right LED is not working. You can decipher what the number is for most numbers, although an 8 will look the same as a 9. Basic instructions are on the back of the calculator. (Back View) According to datamath.org, it cost $118 in 1972, which equals about $600 today, the price of a decent full size laptop computer or two budget "netbook" computers. 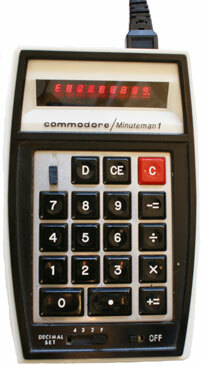 Commodore Minuteman 2 Introduced June 1972 according to History of Calculators - Timeline. See also Timeline. Appears to be the third Commodore pocket calculator made after the C110 which is based on the Bowmar 901B (1971) regarded as the first true pocket sized LED calculator and the similar Minuteman 1 (see datamath.org) made earlier in 1972. See Commodore Calculators. (Also at Vintage Calculators.) Relatively large at 6 x 3.5 x 1.5 inches. Klixon keyboard. There appears to be multiple keyboard designs for the Minuteman 2. Mine has all black keys except for the red C (Cancel) key and the on-off switch is on the bottom. 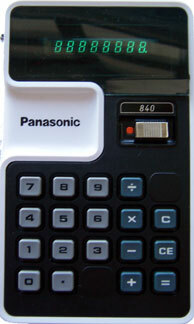 The "Power Pak" with 6 rechargeable AA batteries comprises the entire bottom half of the calculator. (Internal View.) Also runs with AC adapter. Red 8 digit LED display with half height zeros and no tops on 6. Made in USA by Commodore, Santa Clara, California. Serial No. R329540. Four basic functions only with += and -= keys. Mine was purchased on eBay on 2-12-06 for $4.99 with $8.66 shipping. The seller from New Jersey indicated that he bought it while in high school saving up for the $100 price. In good cosmetic and working condition with the included AC adapter (batteries do not have to be present). The batteries no longer hold a charge and have leaked. (Batteries.) The residue was limited to the "Power Pak" section. 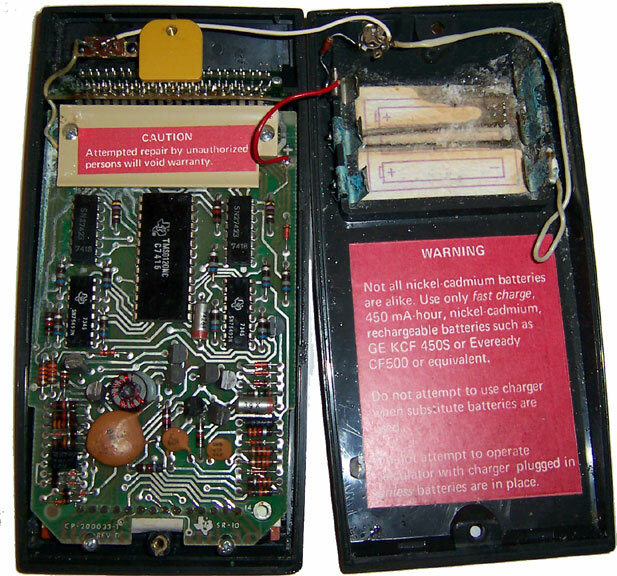 I removed the batteries so that they would not leak further and cleaned out the "Power Pak" section. I strung together 6 AA batteries and it also worked. Curriously, it lights but does not calculate correctly with a 9 volt battery. Commodore Minuteman 3 (1973) 8 digit LED display, 4 function calculator. 6V, .2amp, 1.2 Watts. Made in Japan. Takes four 1.5 volt N cell batteries. There were apparently 8 different versions of the Minuteman 3, some with rechargeable batteries or other features such as square root, % key, or memory. (See timeline and Vintage Calculators.) The internal view shows that my calculator has a Texas Instruments microprocessor, TMS0103NC B7322, and at least one other smaller TI chip (7318). A 2004 advertisement for a used Minuteman 3M states the original sticker price from J.C. Penny was $89.60. Dimensions are about 3 inches x 4 inches X 1 inch. I purchased mine on eBay on 6-25-06 for 1 cent plus $4.07 shipping. Serial no. 159515. It is in good working and cosmetic condition. It was dirty but cleaned up well. Several keys at first were not working or not working well. After using it awhile, however, all keys work fine. The battery compartment is clean, although I don't have batteries to test it. It operates well with a generic AC power supply set at 6 volts. Commodore Minuteman 6X, (circa 1973) a small (approx. 6cm x 9cm x 3cm) six digit LED display calculator with no floating decimal. It does integers only, or you can enter numbers with two decimal points to get answers with two decimal points. It operates on one 9 volt battery and has a wedge shape to provide space for the battery. 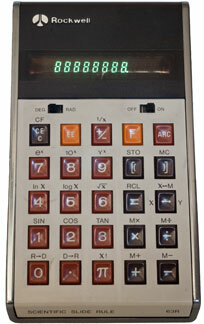 There were two versions, the 6 with algebraic notation and the 6X with Reverse Polish Notation (RPN). 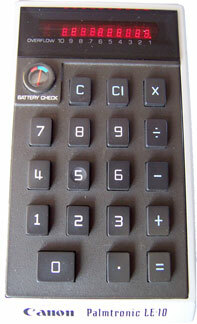 The 6X is the only Commodore calculator with RPN. Mine was made in U.S.A. Serial No. 505362. Current 0.08A. Mine was purchased on eBay on 3-4-06 for $5.54 with $5.50 shipping. In is in good cosmetic condition except for numerous small pits or scratches on the metal front. It turns on and all segments are active. It's a little tempermental, however. Sometimes it displays random characters when you turn it on. If you play with it enough, however, it works fine. The 6X is discussed at Commodore Minuteman 6X (MM6X) and Spyropoulos Site. Commodore Calculators and Vintage Calculators discuss the history of Commodore calculators including this model. Vintage Technology has detailed information on the 6 model. Commodore GL-997R, 1975 green fluorescent ("gl" stands for "green line"), 8 digit, four function calculator with memory and %. Detailed information at Vintage Technology. Unlike the one there, mine has a silver color edge that appears to be painted. Mine was also made in Japan, not the UK. Serial No. 20773. Uses adapter DC-420B which was not included. 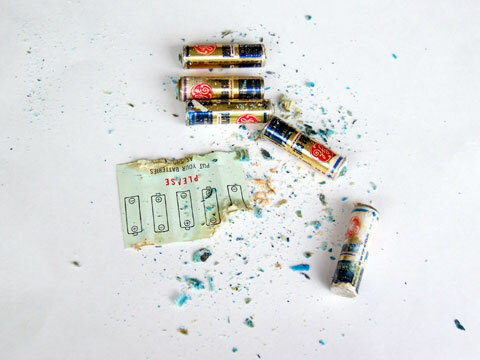 Inside were two hard wired corroded NiCad rechargeable batteries. I took them out and hooked the leads to two AA alkaline batteries in a holder. (Interior View 2.) It worked fine. This could be a long term alternative to the rechargeable batteries although it was difficult to close the case completely. Voltage on the label on the back of the calculator states 4.5V. As indicated, however, it only had two batteries and worked with two 1.5V alkaline batteries. Purchased on eBay on 2-20-06 for $11.50 with 5 other working calculators. Shipping was $10.49. Commodore 797D, circa 1976-1978, made in Japan, serial no. 81874, red 8 digit LED, purchased May 16, 2005 on eBay for $5.06 with $2.99 shipping. In like new working condition. For more information see Vintage Technology discussing the identical looking Commodore 797 made in Hong Kong. 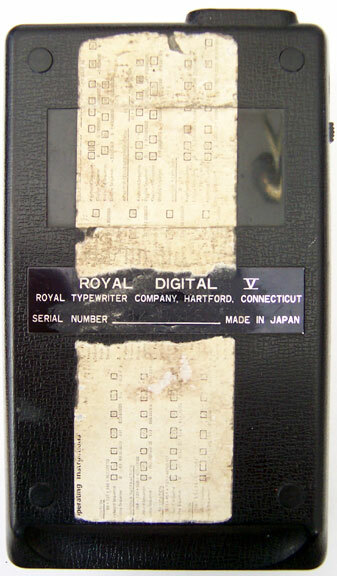 The D designation may simply reflect a later manufacture date or different place of manufacture (Japan instead of Hong Kong) although the Vintage Technology site indicates D stands for disposable batteries. 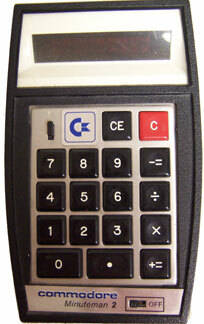 For more information on Commodore calculators, see Vintage Calculators and Vintage Technology Commodore Research Guide. 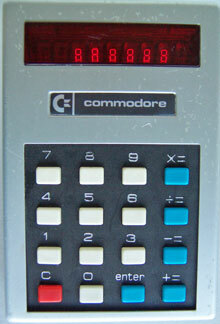 Commodore 798A, LED calculator with memory and square root. Operates on 9 volt battery or AC with adaptor which I do not have. Serial no. 16759. Made in Hong Kong. In very good operating and cosmetic condition. Curriously, many of the keys did not work when I first got it. I picked it up a few days later and it worked fine. Purchased on eBay on 12-6-05 with a TI 1200 for $.99 plus $4 shipping. 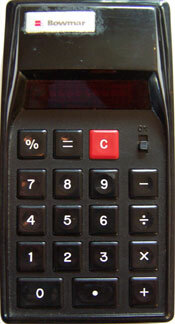 Commodore SR 4120D, 1978 scientific calculator using 9 volt disposable battery. This was very similar to the first calculator I bought at Sears while in college for about $50, except mine used internal rechargeable batteries. This is in good cosmetic and working condition except the second exponent digit is not working :-(. Purchased on eBay on October 7, 2005 with 5 other calculators for $20.50 plus $5 shipping. Excellent information at Vintage Technology. 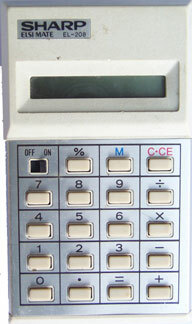 Sanyo Mini Electronic Calculator ICC-0081. 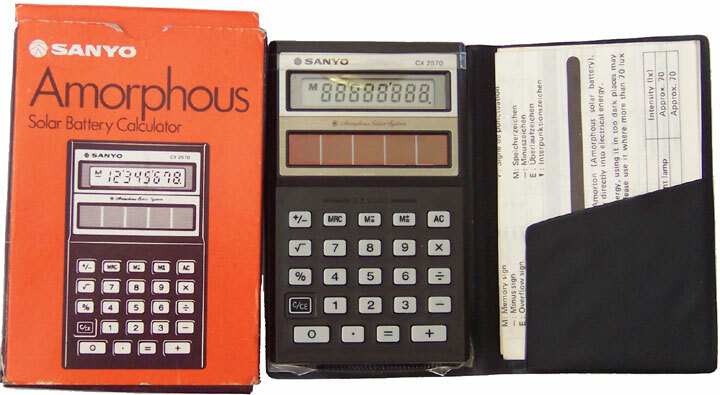 Introduced January 1971 according to datamath.org, making it one of the earliest portable, battery operated, electronic calculators succeeded by only a few other such as the similar Sanyo ICC-82D, Canon Pocketronic, and the Sharp EL-8. It cost $425 in 1971 which has the same buying power as $2,360.47 in 2011 dollars. For the equivalent price you can buy several iPhones or several laptop computers today. The ICC-0081 only does the four basic operations. It has an eight digit Nixie tube display. You could enter, and the calculator would display, up to 16 digits, however. That's pretty impressive since a lot of simple calculators today handle only 8 digits. As I write this, the Windows 7 calculator on my computer does at least 32 places. Incidentally, the computer and monitor I'm using cost only $300 in 2011. While portable, this calculator was not yet a pocket calculator. According to the specification in the manual, the dimensions were 14.1cm, x 24.8cm x 7.1cm, and it weighed 1.75kg or 3.851 pounds. I purchased mine on January 27, 2012 in the Coronado Cays area of Coronado, California from an ad on Craigslist. The Craigslist ad listed it for $150. The owner had not been able to get it working, however. With the AC the display would flicker as you turned it on and off. I was therefore able to purchase it for $40. I have not been able to get it working. The NiCad battery pack is heavily corroded and, not surprisingly, does not hold a charge. Indeed, one of the wires was loose as a result of the corrosion. 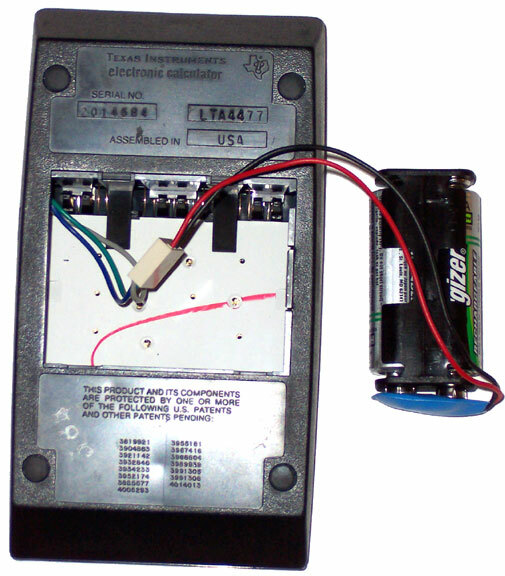 As an alternative to the five 1.2 volt NiCad batteries, the calculator was also designed to work with four 1.5 volt "C" batteries in a special battery pack. I tried it with four 1.5 volt AA batteries in a battery pack and only got a flicker on the display. There was some corrosion on the electrical connections, but nothing significant. I therefore think there is something more significant going on. If anyone has any ideas on how I might fix it, please let me know. In any event, it is a nice display piece. It is in excellent cosmetic condition except for some chew marks on the battery cover from a small dog the seller once had. The seller was the original owner. He received it as a present from his wife in the early 1970s. The calculator easily comes apart by removing 4 screws from the corners. The bottom two are under the feet pads. See Internal View. The calculator came with the owner's manual and the hard plastic cover. Sanyo CX 2570 Amorphous Solar.Sanyo is a leader in thin film amorphous (non-crystaline) solar cells. An early use of amorphous solar cells was in calculators. One site indicates Sanyo's first practical use of amorphous solar cells dates back to 1980. Instruction pamplet code is R-4777384 perhaps indicating a manufacture date of March 1984. Purchased on e-Bay on 7-2-05 for $1 plus $2 shipping. The calculator is in excellent working condition with the case, box and instruction pamphlet. Rockwell 8R (1975). Red 8 digit LED display. Purchased on eBay on 11-9-05 for $8.50 with $5 shipping together with a Unisonic 888 and a TI 30, batteries included in each. Takes 9 volt battery. Excellent cosmetic condition. Excellent working condition except one LED segment is not showing in the highest place value. An 8 looks like a six. Assembled in Mexico with U.S. and foreign parts. Seriel no. 119722. Excellent information at Vintage Technology and Vintage Calculators. Rockwell 10R (1974). Red LED display. Good working condition. Purchased on eBay. 9 volt battery. Excellent information at Vintage Technology. Manufactured by Microelectronic Product Division of Rockwell International, Anaheim, CA92803. Rockwell 24RD (1975). Green/blue fluorescent display. Good working condition. Purchased on eBay. 4 AA batteries. Excellent information at Vintage Technology. The history of Rockwell International is spelled out at Wikipedia. The company was formed as a result of a number of mergers in 1973, but traces its roots back decades earlier. As a result of spin-offs starting in about the late 1970s, Rockwell International as such no longer exists. Rockwell was involved in the manufacture of both the Apollo rockets and the space shuttle as well as the Navstar Global Positioning System satellites. Unicom 1010P (circa 1972) an electronic, printing only desktop calculator, the Unicom 1010 P was made by "Unicom Systems, Inc.," located in California, according to the tag on the back. Unicom is described as the business unit of semi-conductor manufacturer American Micro-Systems, Inc. (AMI) in the Old Calculator Web Museum. 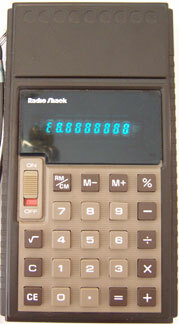 The Unicom unit which sold calculators was acquired by Rockwell in 1972 according to the Vintage Calculators Web Museum which indicates, under Integrated Circuit Manufacturers, that semi-conductor manufacturer American Micro-Systems survived. It is now AMI Semiconductor and moved to Pocatello, Idaho. The calculator was made in Japan. Serial No. 358949. Uses .3amp, 26 watts. 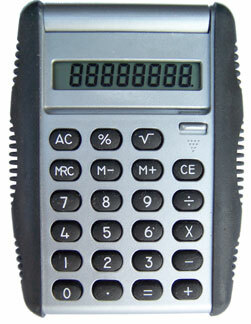 It is big for an electronic calculator with dimensions of approximately 22cm x 30cm x 8.5cm and weighing over 9 pounds. 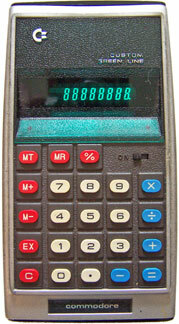 Essentially the identical calculator was also sold by Ricoh as the Ricomac 1010P. See www.dentaku-museum.com. 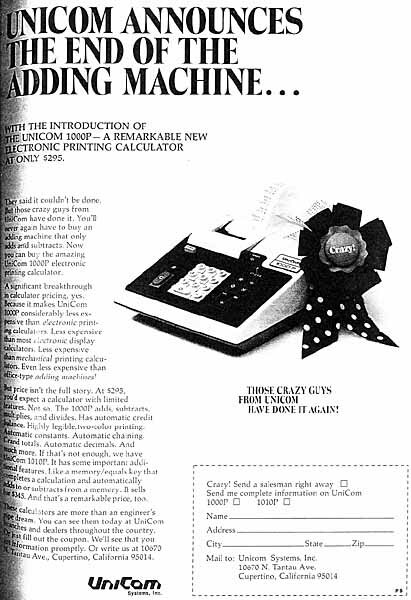 An advertisement for the Unicom 1010 P is contained at Vintage Calculators Web Museum - Old Calculator Advertisements under the year 1972. (Curiously, the higher model no. 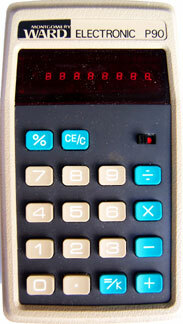 1200 was made in 1970, however, according to the Old Calculator Web Museum. See also www.devidts.com.) The advertisement promotes the low price of the calculator at $345, about $1670 in 2006 dollars! 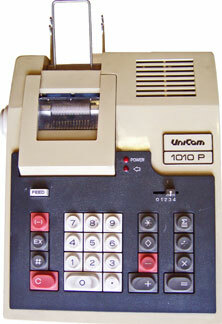 (The Unicom 1000P without a memory sold for only $295). My Unicom 1010 P was purchased at a yard sale in La Mesa on 6-25-06 for $1. It is in good cosmetic and operating condition. 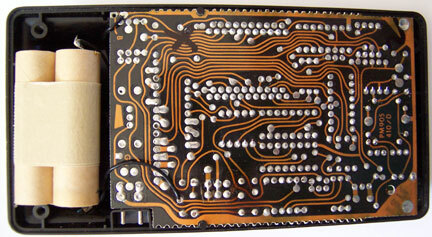 See internal view and close-up of main circuit board. Sears C1 (circa 1972). Appears to be a variation of the first LCD calculator, the Lloyd's Accumatic 100, produced by Rockwell in 1972, according to Vintage Calculators. See www.dentaku-museum.com (in Japanese). 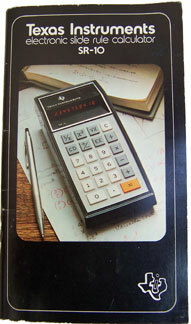 Vintage Calculators states that Lloyd's was a subsidary of Rockwell. Unlike the Accumatic 100 the C1 has AC power only. It also does not have a flip up cover. The crystal on substrate LCD with black letters against a silver background is lit by a incadescent blub to aid visiblibilty. This however defeats the energy savings of the LCD display which is less important in an AC only model anyway. My C1 is in good working and cosmetic condition except two of the digits are damaged as can be seen in the photo. Purchased on eBay in 2005 for as I recall $10. I purchased another one on eBay on 1-5-05 for $12.50 with $5.75 shipping in excellent cosmetic and working condition. 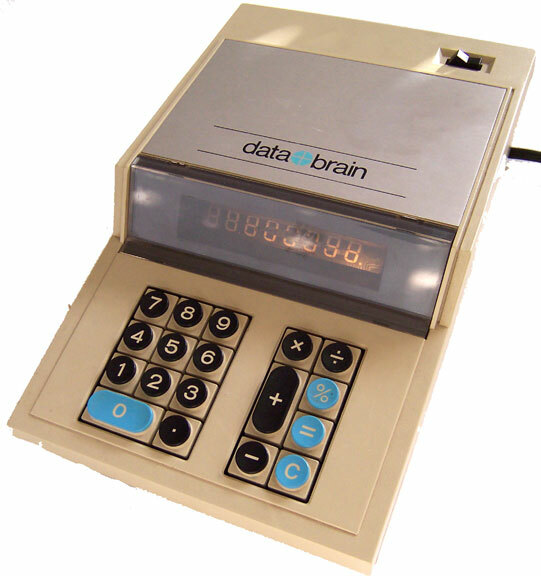 Data Brain 1000 (circa 1972) WBE, Inc., Serial No. 14064, 0.03 A, assembled in Mexico primarily of United States parts. Identical inside and out (except for key color) to the Rapid Data Rapidman 1208LC made by Rapid Data Systems & Equipment Ltd., of Ontario, Canada, described at Vintage Calculators with Rockwell integrated circuits. 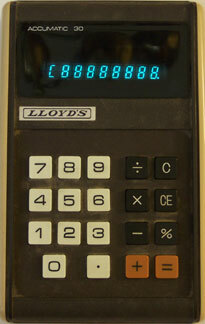 Another variant of the Lloyds Accumatic 100 with early crystal substate LCD display. The back has a removable cover to store the cord. In the Accumatic this is where batteries would go. Mine was purchased on eBay for $1 with $6.63 shipping together with a working TI 3500 (no cord), TI 30 (LED) and TI 2510. Good cosmetic and working condition except the middle section of the LCD appears to have a bubble or separation. Vintage Calculators notes there appears to have been manufacturing problems in these early LCD calculators. Photos Large, back with storage compartment, circuit board, light, display. Lloyd's Accumatic 30, Japanese 8 digit green fluorescent calculator purchased at a garage sale on July 16, 2005 for $.25. It initially did not work, but I got it working by scrapping the battery contacts with a small screwdriver. The contacts had corrosion from battery leakage. Vintage Calculators states that Lloyd's was a subsidary of Rockwell. Rockwell 63R Scientific Calculator (circa 1974-1976) 8 digit green fluorescent scientific calculator purchased at an estate sale in La Mesa, CA within a mile of my home on October 8, 2011 for about $4 or $5. (I bought 3 items for $10). It contained three rechargeable Nicad batteries in battery pack. These were heavily corroded. Further, the calculator did not come with an AC adapter/charger. It was an easy conversion to alkaline 1.5 AA batteries. The batteries go in from top to bottom, left to right, in this order: top + -, middle - +, bottom + -. There is a little + sign in the plastic at the top left to get you started in the right order. The batteries have metal contacts on the right side joing the top and middle batteries, and on the left joing the middle and bottom batteries. I folded pieces of Aluminum foil to replace these. After getting things packed in sufficently tight, it worked! I assume you could make a new Nicad battery pack joining the batteries with metal pieces sodered on as indicated above. You would also need to have the correct charger. 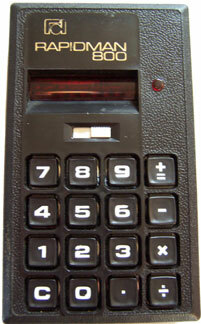 The calculator was assembled in Mexico with U.S. and foreign parts. It is Serial No. 104015. It comes with the case and instruction manual. There were three types according the the Vintage Technology Web Site which has detailed information on the Type I and Type II. Vintage Technology identifies the date as 1976. 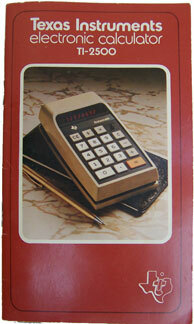 The manual has a copyright date of 1974.The calculator is in very good working and cosmetic condition. It is a true scientific calculator with trigonmetric functions, log to base 10, natural logrithms, scientific notation, sqare roots, Pi, and factorials. It has a limited number of keys because just about every key has a dual function using the F or Function key at the top. It allows for relatively large keys and a a relatively compact keyboard at the expense of having to use a "F" key to shift functions. There is also a separate key for arc sin, arc cos and arc tan. The "arc" notation has generally been replaced by the sin, cos or tan to the negative 1 exponent in modern calculators and text books. Calculators like the Commodore SR 4120D take the alternate approach of having a large number of keys without a shift or function key. The Commodore SR 4120D does have an arc key, however. My Rockwell 63 has engraved on the top back in small letters B. Bracka, Dept. 641-2. From business cards with another calculator, I learned Bruno W. Bracka was the Director of Structures and design for the Convair Division of General Dynamics. From the books for sale at the estate sale, it appeared he may have been an engineer. The estate sale also had some slide rules which I assume was what Mr. Bracka used before this calculator. Convair, formed from the name of Consolidated Aircraft and Vultee Aircraft, was an aeronautical and defense contactor headquarted in San Diego for decades. It had operations near San Diego Bay - Lindberg Field as well as operations in the Kearny Mesa area of San Diego. Convair or its predecessors built important aircraft during World War II and built aircraft, missles and rockets during the 1950s until the mid 1990s. They were a major employer in San Diego during my youth and early adulthood. My friends' dad across the street from my boyhood home was a physician who worked for Convair on the space program. Bowmar 90506, circa 1972, red LED diplay. 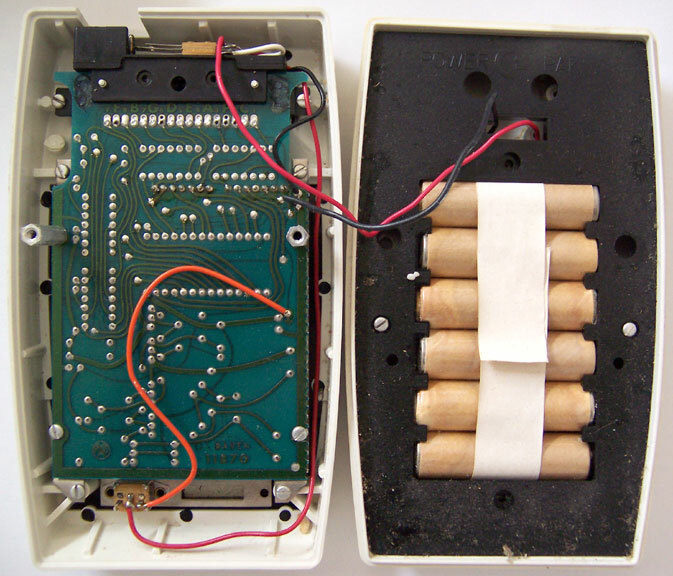 Powered by three AA size sealed internal NiCad batteries as shown in this internal view. The eBay description said the batteries still held some charge and the unit worked. It did not come with the adapter. The AC input has two prongs and I do not have a generic adapter to fit it. I have therefore not tried it with the internal batteries or AC. I did hook up the internal contacts to three AA alkaline batteries briefly and the calculator worked. The cosmetic conditon is good with some pitting around the name plate. It comes with a zippered Bowmar case in very good condition. Made in U.S.A. by Bowmar/Ali Inc., Acton, Mass. Seriel No. 199981. 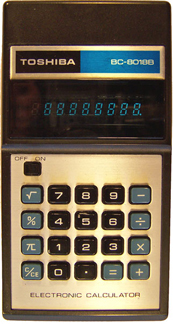 The Bowmar 901B (Bowmar Brain) released in September 1971 was one of the first LED pocket calculators and Bowmar quickly became one of the largest producers of calculators. With heavy competition and rapid price decreases, Bowmar filed for bankruptcy in 1976. Purchased on eBay on 11-7-05 for $5.50 with $7.85 shipping for this and another calculator. Sears 728.58821 (circa 1973) basic 4 operation LED calculator presumably made by Bowmar since the case and keys are very similar to the Bowmar 905 and MX 55. (See Vintage Calculators.) Takes three AA 1.5 volt batteries. In very good cosmetic and working condition. Comes with case and instruction manual. Purchased on 11-11-05 on eBay with 24 other calculators and organizers for $9.99 with $7.70 shipping. Excellent information at Vintage Technology. 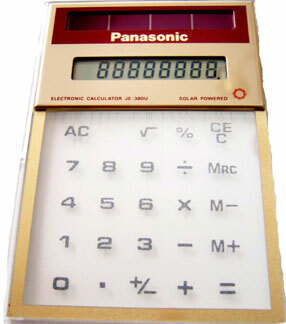 Panasonic JE 380u a stylish, thin, solar calculator with a transparent keypad. 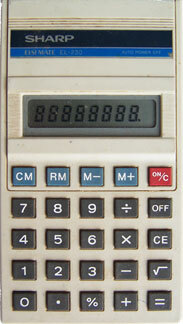 It is not a true overhead calculator, however, since it does not have a trasparent display. Purchased on eBay on June 19, 2005 with three other calculators and a compact clock for $7.50 plus $5.60 shipping and insurance. Excellent cosmetic and working condition. Panasonic JE 381u similar in style to the 380, the 381 is smaller and has a horizontal format. Bought in same lot as the the 380, it is also in excellent cosmetic and working condition. Panasonic is a diverse Japanese electronics company. Its present slogan is "ideas for life." I remember it use to be "just slightly ahead of our time." Panasonic 840 according to buffalocalcs.org sold in 1973-1974. Also known as JE-840U. Blue fluorescent display. Very 70's style. In excellent working and cosmetic condtion. Purchased on eBay in 2005. 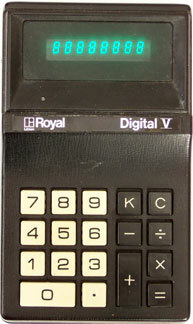 Royal Digital V, (1972) eight digit green fluorescent display. All digits are always displayed. It has an interesting modular internal design. The top and back pieces snap apart. 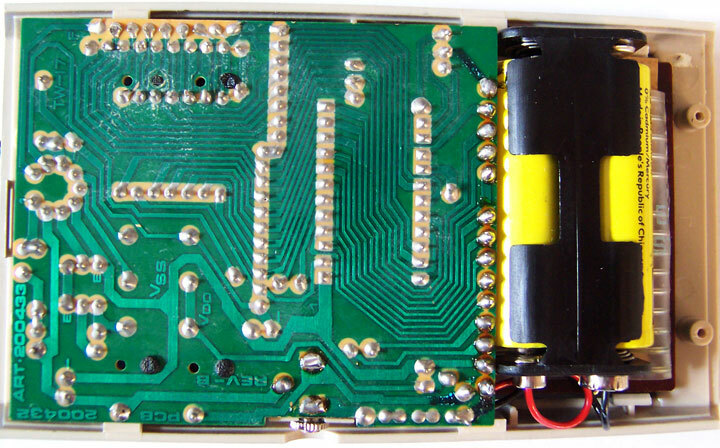 The entire circuit board lifts out from the bottom with a plug like connector (shown from bottom of circuit board) connecting the bottom and circuit board. 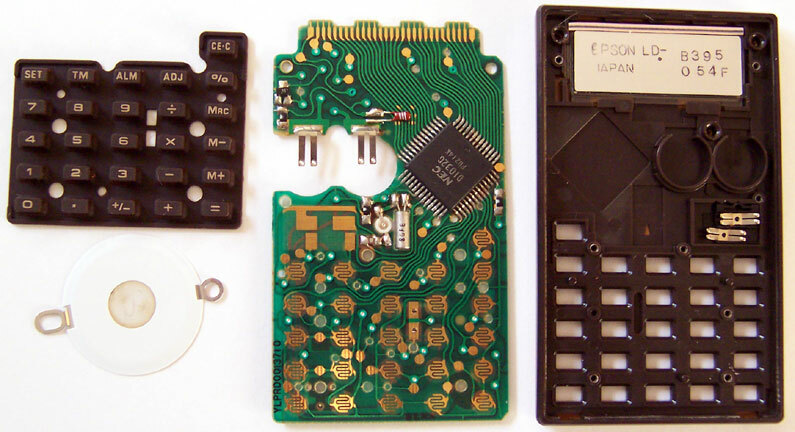 The keypad (bottom shown) disconnects from the circuit board by removing four clips. 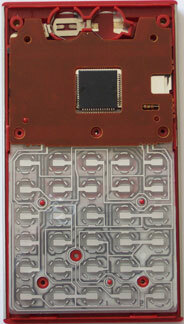 The silver colored metal contacts on the back of the keypad contact the gold colored contacts on the circuit board when a key is pressed. The earlier Digital IV discussed at Vintage Calculators did not even have a keypad. You simply touched the gold contacts with an electrical stylus. 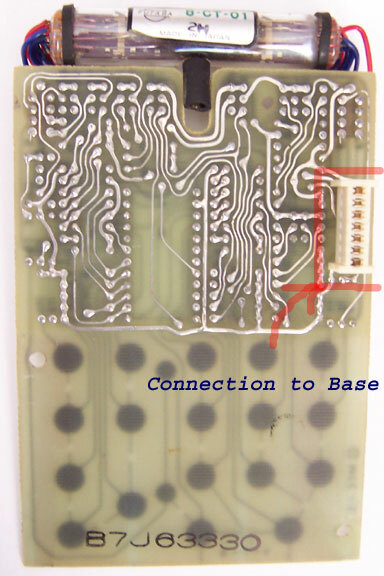 The fluorescent display is housed in a single glass tube shown at the left of this photo of the circuit board. It was purchased from Canada on eBay on July 31, 2005 for $1 with $3 shipping. It is in good working and cosmetic condition although some keys, especially the division key, are a little sticky. See Vintage Calculators and Calculator Technology Site for more information. Note the English Imperial model at Vintage Calculators uses 6 AA NiCad batteries while my US Royal model uses one 9 volt battery. Both are made in Japan. Mine may have been later converted to take a 9 volt battery. Royal 91K, circa 1975-76, green fluorescent display, % key, memory, 4 AAA batteries, 8 digit with 9th for negative, memory and error. Purchased June 14, 2005 on eBay for $.99 with $2.90 shipping. In excellent cosmetic (except has driver's license # engraved on it) and working condition. According to Vintage Calculators it was made in Japan by Imperial Typewriter and Business Machines Limited, Leicester, England. Vintage Calculators states Imperial was acquired by Litton in 1966 and merged with Litton's Royal Typewriter Division. 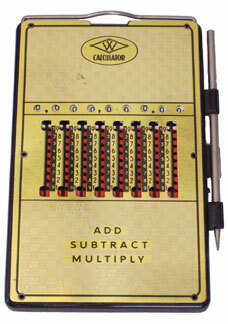 Similar calculators were sold under the Imperial and Royal names, and also under the German Triumph or Adler names, which were also part of Litton. 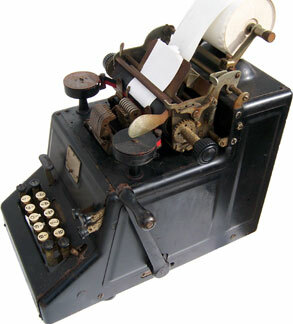 Vintage Technology has detailed information about the similar Imperial 91S (the 91S has Pi and square root keys). Citizen EC 110, LCD desktop pen set purchased at a garage sale for I recall $1 or so. In good working condition. Credit Card Calculator, credit card sized calculator obtained as a gift from insurance company. Solar with LCD display. Quarter in photo to show size. In working condition, although some display problems at bottom. It is so small that it is difficult to use with one's fingers. 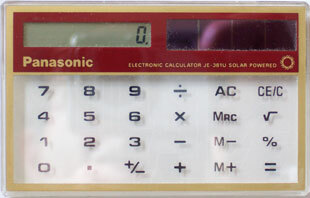 LeWorld,basic solar calculator puchased at Wal-mart in the Summer 2003 for $1, about 1/600th the price of a Datamath in constant dollars! Compared to a Datamath it's much smaller, several times lighter, has more functions, and never needs batteries or recharging. Garrett 2002, (1972) 8 digit, four function desk calculator with clock with date, alarm and count down timer, in good working and cosmetic condition, made in the U.S.A. by "Garrett Comtronics Corporation, San Diego, California, a subsidary of the Garrett Corporation, one of the Signal Companies," serial no. 008265, current use .06 amps, purchased on eBay on May 18, 2005 for $21.50, $8.05 shipping. That's expensive, but I liked the stylish design with wood trim, clock function and San Diego connection. See datamath.org, the next highest bidder. New price in 1973 $149.50, about $655 today! "U.S. Patent Des. 227,672 and other patents pending." See Patent 3,813,533. 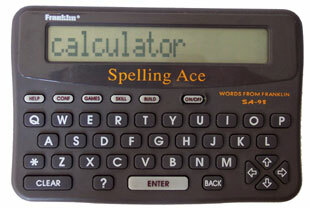 Franklin Spelling Ace SA-98, back has copyright date of 1994 by Franklin Electronic Publishers, Inc. (New Jersey). Made in Thailand. Enter a word and it tells you if it is spelled correctly or gives alternative corrections. It includes word games like hangman, anagram and jumble. It has a relatively large display with excellent contrast. We got it for our kids, but it has not been used much. (I prefer a pocket dictionary or MS Word's spell checker.) Excellent cosmetic and working condition. The batteries leaked, but it still works. I've included it in the calculator museum since, while it does not calculate numbers, it is based on the same technology. Franklin is historically significant in personal computer history having made a line of Apple II and PC clones. Apple sued Franklin and eventually won. (See Wikipedia article.) Franklin left the computer business to publish e-books and make various handheld devices like spelling correction devices, dictionaries, translators and organanizers. 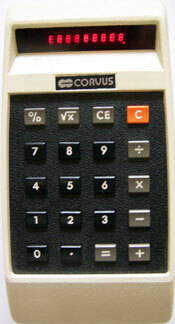 Corvus 400, (1974-75) 8 digit LED. Datamath has excellent technical information. Corvus Corporation of Dallas was the consumer division of integrated circuit manufacturer Mostek. Originally sold for $39.95 and later sold under the Radio Shack label in 1975 for only $19.95. My Corvus 400 was purchased at a garage sale in 2005 for $.25 with the box. It is in excellent cosmetic and working condition. It takes four unusual N cells for a total of 6 volts. Not having N cells, I got it working with two AAA cells connected with aluminum foil. While that arrangement only supplies 3 volts, it worked. The calculator has an unusual N key which counts the number of entries making it more convenient to find the mean of a set of numbers. Larger image. Teal Credit Card Calculator, a promotional calculator from PC World magazine, it came in a cover that said "Teal" leading me to believe it may be a Teal calculator. Solar powered. Transparent. As you can see from the second photo, in the right light you can see the circuits embedded in the glass or plastic. In good working and cosmetic condition. I do not know the date manufactured. 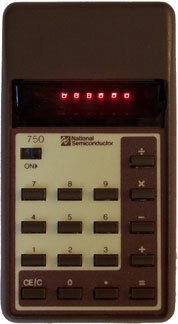 National Semiconductor 750, very basic LED calculator with six digit display. Made in Hong Kong. In good working and cosmetic condition with instruction sheet and box. Purchased on eBay on July 1, 2005 for $1 with $3 shipping. Sears Electronic Slide Rule 801.58770, (1974) scientific calculator with blue florescent display. Has trigonometric and logarithmic functions but curiously apparently does not have scientific notation. Purchased on eBay on 12-29-05 for $5 with $5.85 shipping. Well used with many minor scratches. Works although the keys have a tendency to repeat unless you press them lightly. Sold by the original owner who used it in college in 1975. Hermes 811, 8 digit green fluorescent calculator purchased at a San Carlos (San Diego) area garage sale on 10-22-05 for about $1. 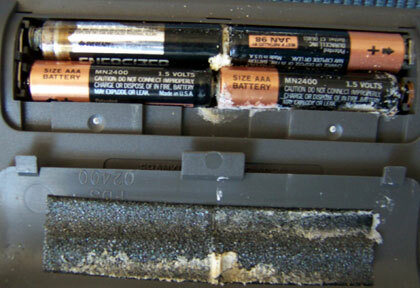 Extensive corrosion from 5 NiCad batteries. After chipping this away with a small screwdriver it worked with 5 new AA batteries. The logic for addition and subtraction is somewhat unusual. You can't press the enter key. Instead you press the + key again. Many of the early desktop calculators also seem to work this way. 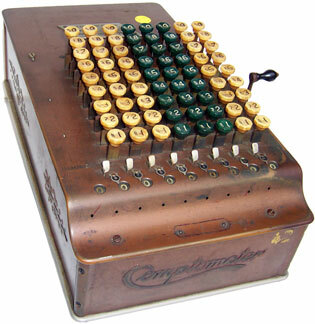 It has a single memory, a +/- key, floating and fixed decimals (4, 2, and $) and a summation button. I could not find much information about the calculator. Hermes is a Swiss Company now called Presica. 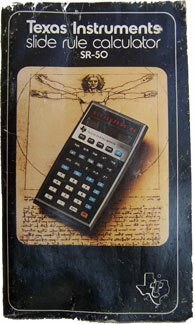 From 1943 to about 1978 Hermes made electric mechanical calculators. Their history indicates they "missed the technology progression to electronics." This Hermes 811 was made in Taiwan and not Switzerland. It is serial number 262570. I could not find the date of manufacture. I speculate that it may have been made by another company with only the Hermes nameplate. The red, white and blue keys, as well as the individual key design, is similar to Commodore calculators. I could not find a Commodore calculator just like it, however. Given the fluorescent display and relatively large size (about 9cm x 4cm x 15cm), I would guess it was probably manufactured from e.g., 1972 to 1976. It is in very good cosmetic condition and comes with a soft case. 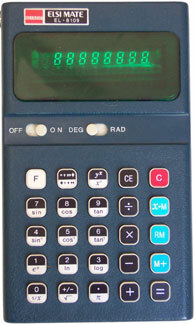 Radio Shack EC-375, circa 1975, blue fluorescent display, memory and square root, made in Japan. Excellent information at Vintage Technology. Purchased on eBay on 10-20-05 for $.99 with $3.85 shipping. In excellent cosmetic and working condition. 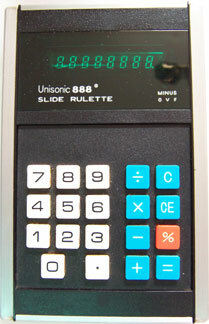 Unisonic 888 Slide Rulette, (1975) 8 digit green/blue fluorescent display, 4 operations and %, Japanese calculator, operating on 4 AA batteries (6 volt, 0.3 Watts, optional AC input). Seriel no. 008529. Purchased on eBay on 11-09-05 for $8.50 with $5 shipping with a TI-30 and Rockwell 8R, batteries for each included. In excellent cosmetic and working condition. It is quite stylish forming a perfect rectangular prism with brushed metal sides, black plastic front and sides, and white blue and orange keys. 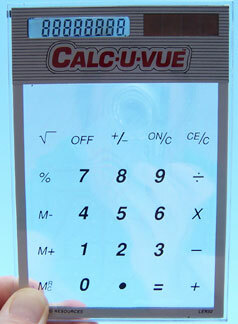 Calcuvue Overhead Calculator, designed to be used with an overhead projector. While all of the overhead calculators are made of glass, this one is cool because almost all of the keyboard is transparent. The photo was taken holding the calculator against a blue sky. (Looking closely you can see the reflection of me and the camera.) The calculator is in excellent working and cosmetic condition. It was a gift from my sister which she used teaching adults several years ago. Rapidman 800, (1972) early Candian calculator with one piece plastic case purchased on eBay in October 2005 for $5.50. Excellent information at Vintage Technology. This is in good cosmetic and working condtion except you have to hold the opertating switch down for it to work. I purchased a white one on eBay on 11-26-05 for $4.99 with $4.30 shipping. I will include a photo later. APF Mark 26, red LED 8 digit calculator using 9 volt battery. Made in Japan. Purchased on eBay 10-05. In very good cosmetic and operating condition. Virtually identical to the Ward Electronic P90 except the P90 does not have a memory. See Vintage Electronic Calculator Manual for manual. 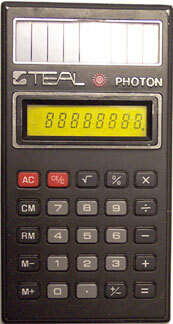 Teal Photon, 1976-78, one of the first light powered calculators, and therefore does not have an on-off switch. 8 digit LCD screen with yellow filter to prevent UV damage. 4 functions, %, square root and memory. In good cosmetic and working condition. Purchased on eBay on for GBP 3.60 (approx. $6.27) and GBP 2.99 shipping from Abingdon, Oxfordshire, United Kingdom, my first European purchase that I recall. 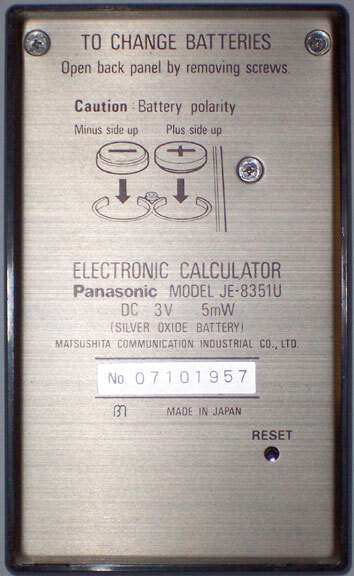 Excellent information at: Vintage Calculators Web Museum, Solar Calculators, History of Electronics, and dentaku-museum.com (in Japanese). 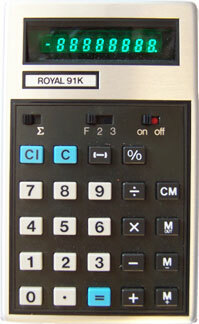 Other early solar calculators released about the same time were the Sharp EL-8028 and the Royal Solar 1. 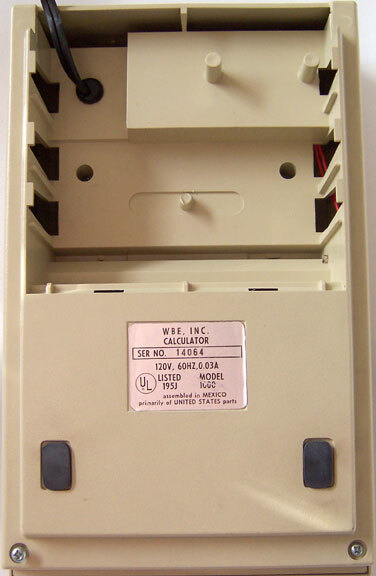 Montgomery Ward Electronic P90, basic four function LED calculator which is virtually identical to the APF Mark 26 above except the P90 does not have a memory. Made in Japan. 9 volt battery. In excellent working and cosmetic condition. Purchased as part of the lot of 24 calculators and organizers for $9.99 with $7.70 shipping. Flip Top Calculator, a no-name LCD 8 digit calculator with square root, % and memory with a flip open top that also serves as a stand when opened. Made in China. Presumably of recent origin. While I assume it is very inexpensive, it is not a bad little calculator. Purchased as part of the lot of 24 calculators and organizers referred to above. 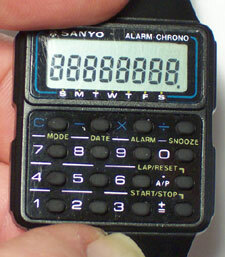 Sanyo Alarm Chrono Calculator Watch, amazingly small. Date unknown. Purchased on eBay on 2-5-06 for $.01 with $1.75 shipping. It needed a new LR1130 battery. It then worked, although the battery connection is poor. Right now I have a dime inside so that the battery makes contact! 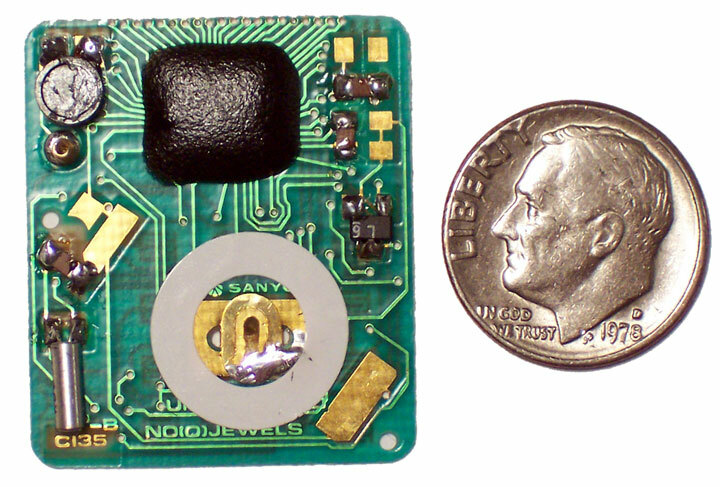 There are only a few small components which amazingly give you calculator, time, stop watch and alarm functions. The calculator buttons are so small that they are hard to see and use, however. Large, Circuit Board, Case Interior, Interior Components. 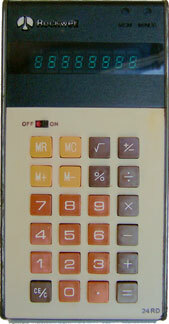 Corvus 312, (1974) manual states: "Today's most advanced MOS 'calculator-on-a-chip" integrated circuitry provides instant addition, subtraction, multiplication, square root, percentages and division." Excellent entry at datamath.org indicates Corvus was the consumer division of chip manufacturer Mostek. The original price was $69.95, over $280 in 2006 dollars. 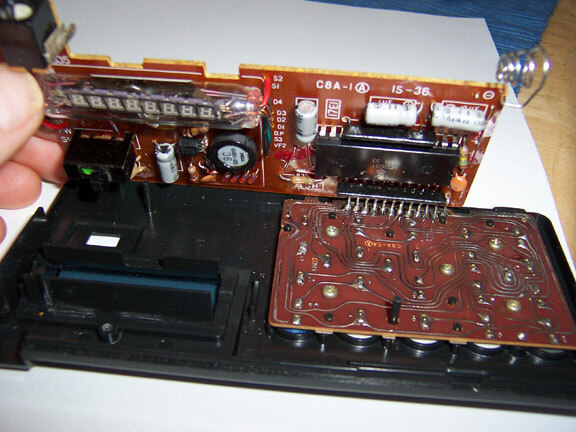 Removal of the battery cover reveals three NiCad batteries. The Model 310 was identical except it used three AA disposable batteries. The model 311 used disposable battery or an AC adapter. Remarkably, the NiCad batteries still recharge! Purchased on 2-20-06 on eBay as part of a lot of six calcuators for $11.50 plus $10.94 shipping. In excellent cosmetic and operating condition. Serial No. 312-166549. 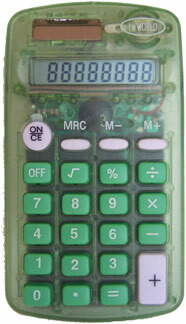 Hanimex 2106, basic four function green flourescent calculator in good operating and cosmetic condition. Takes two AA batteries. Minor corrosion in battery compartment not affecting operation. Purchased on 2-20-06 on eBay as part of a lot of six calcuators for $11.50 plus $10.94 shipping. Unisonic 1548, (circa 1978) 8 digit LED calculator in good operating and cosmetic condition. Date is approximate based on dates of similar calculators at Be-Calc. Takes two AA batteries. Made in Hong Kong. Has 1/x, x squared, square root, %, parenthesis, +/- and memory. Purchased on 2-20-06 on eBay as part of a lot of six calcuators for $11.50 plus $10.94 shipping. Symbol, (May 1999) a handheld touch screen organizer with address book, calendar, memo pad, expense record, mail, clock and bar code reader. It operates on the Palm operating system. You enter information with a stylus that is stored on the side of the machine. Pressing the abc icon gives you a keyboard on the screen to enter letters. This one is rather specialized with the bar code reader. Uses two AAA batteries. In excellent working and cosmetic condition. 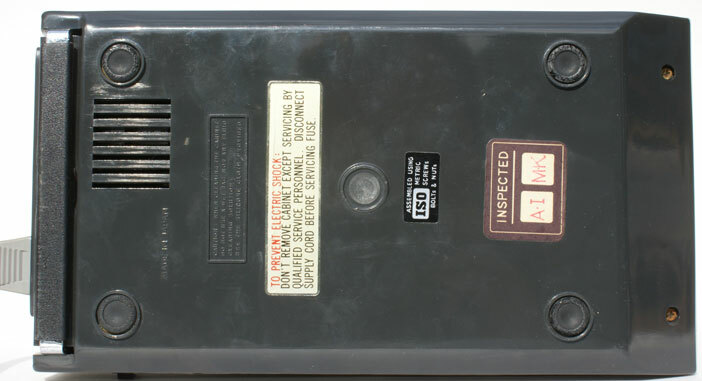 Manufacturing date of May 1999 was on the back of the device. Comes with a craddle and serial cable for transferring information. (Too bad no USB.) Purchased at a garage sale in late 2005 or early 2006 for $1. I suspect it cost hundreds new. 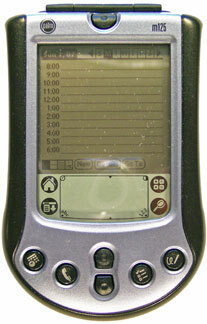 Palm m125, (2001) According a review at CNET, this intermediate level PDA has a "333MHz processor, 8MB of RAM, and Palm OS 4.0," together with an SD card slot for extra memory storage, similar to more expensive Palm PDAs at the time. CNET thought the $250 list price for a monochrome display PDA was high, however. (See also Palm Info Center). While no longer sold, Palm still provides support information. Uses two AAA batteries. Unfortunately I do not have the USB transfer cradle. I purchased a transfer cable on eBay for a total of $5.07 which included tax and shipping. I purchased my Palm at a garage sale on 12-31-06 for $1 - pretty steep depreciation in five years! It is in great shape and perfectly usable. Does one need the latest and best PDA for hundreds of dollars? 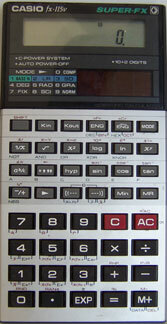 Toshiba BC-8018B, (1979) basic fluorescent display calculator with square root, % and Pi keys. Uses two AA batteries. Purchased on eBay. In good operating and cosmetic condition. Information at Datamath, 1000bit.net, Vintage Calculators and Computers, and Buffalo Calcs. 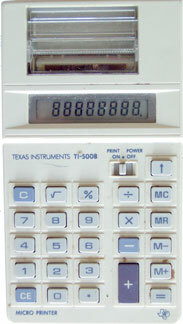 Datamath.org indicates many modern Texas Instruments calculators and Texas Instrument desktop calculators from 1981 to 1988 use Toshiba microprocessors. 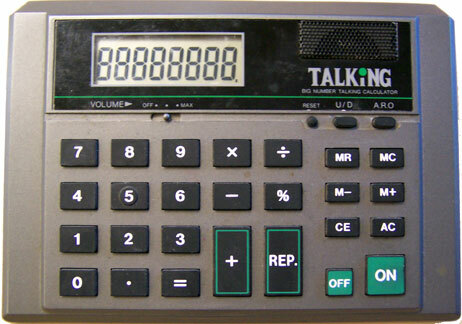 Talking Calculator 09, LCD calculator with synthesized female voice that reads the digits of the imput and answer. Has volume and voice speed control. The voice is cool, yet annoying. I can't think of many practical benefits except maybe use by the visually impaired or as a confirmation for keying in the numbers without looking. In good working condition. This calculator was a generous donation to the museum from a Stella Maris Academy teacher in September 2005. Talking Big Number Calculator, LCD calculator with synthesized female voice that reads the digits of the imput and answer. Has volume and voice speed control. In good working and cosmetic condition with some scratces. This calculator was a generous donation to the museum from a Stella Maris Academy teacher in September 2005. Comptometer Model J, very cool machine purchased at a San Carlos (San Diego) garage sale on April 23, 2005 for $15. It is in good cosmetic and working condition. To use it you just key in the numbers using the correct place values. The running total appears at the bottom. This ingenious design dates back to 1885. This Model J according to the serial number was made in 1926. The Model Js are the only model with a letter in the serial number - J obviously. The next two numbers are the year. 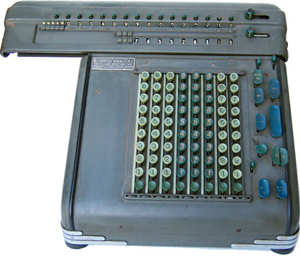 There is a terrific site called Biography of a Machine about the Comptometer, including all the models, the company history, the company training schools, comments from former operators, and much more. Be sure to check it out. There are dozens of other sites. Just put in Comptometer in a search engine and you can read for hours. 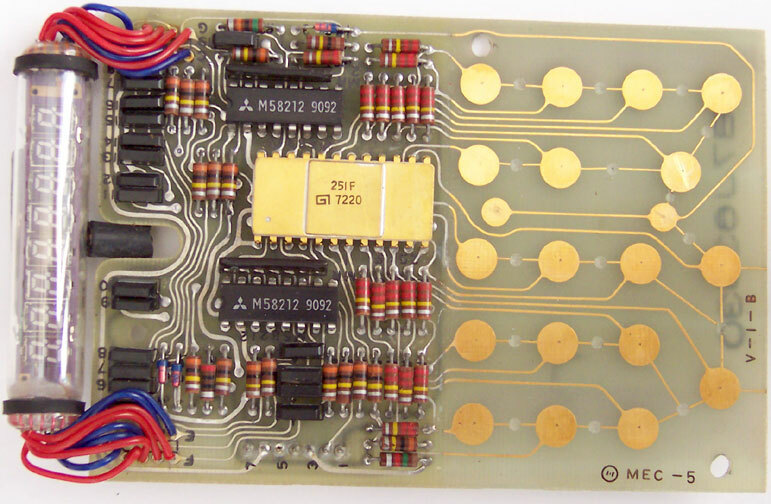 This "direct adder" is explained at the HP Museum site. 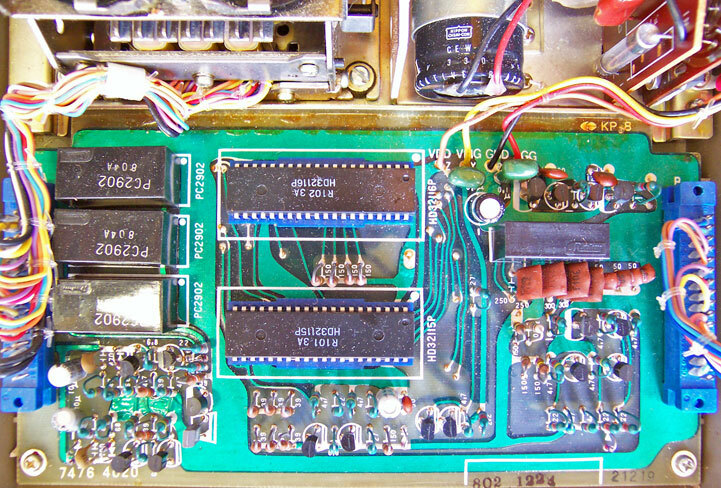 Another site has great internal Comptometer Photos. Just think, before that garage sale I didn't even know what a Comptometer was! Dalton Adding Machine, (1902-1928) the first and best known 10 key printing adding machine of its time. (Museum of HP Calculators and Dalton Adding Machine.) A great photo of an office with one in 1911 is at Early Office Museum. There were apparently many variations, some with glass windows to see the internal workings. Mine has a little door on the front to see some of the internal workings. Dalton merged with several other companies in 1928 to form Remington Rand. (See Charles Babbage Institute and Early Office Museum.) Remington Rand built UNIVAC, the first commercial electronic computer, in 1951. Remington Rand was acquired by Sperry in 1955 to become Sperry Rand which continued to make UNIVAC computers. In 1986 Sperry merged with Burroughs, which also made adding machines at the turn of the century, to become the present day company, Unisys. (Charles Babbage Institute) My Dalton adding machine was a generous Christmas gift in 2005 from my sister who purchased it a garage sale. It is in working condition. It needs a new ribbon. The cosmetic condition is fair with peeling paint and rust on the unpainted parts. The Dalton name on the back is only faintly visible. It is serial number 150652. It weighs about 31.6 pounds. Please let me know if you are aware of the date of manufacture of my machine. Friden Model D8 Electro-Mechanical Calculator, Serial No. D8-216119, made in San Leandro, California. Weighs about 33.6 pounds. An old eBay title listed the dates as 1940-1949. This is consistent with other information. Calculator Collection lists the similar but more modern looking 1949 Friden DW-8. Office Machines Americana lists the "Friden Model 'D' Calculators Complete Service Manual Dated November 1939" for sale for $27. John Wolff's Web Museum, Full-Keyboard Rotary Calculators lists the larger C10, one of Friden's first calculators, with identical looking keys and chrome trim with dates of manufacture of 1935-1949. Several sites have excellent information about Friden electro-mechanical calculators including The Old Calculator Web Museum with an excellent article on the Model STW-10 including internal photographs, The Story of Carl Friden, The Friden Web Site and Old Calculator Web Museum Ads. I purchased my Friden at a garage sale in the Fall of 2005 for I recall $5. It is in good cosmetic condition. It ran for awhile chugging away for several minutes then jamming. It makes a lot of noise! 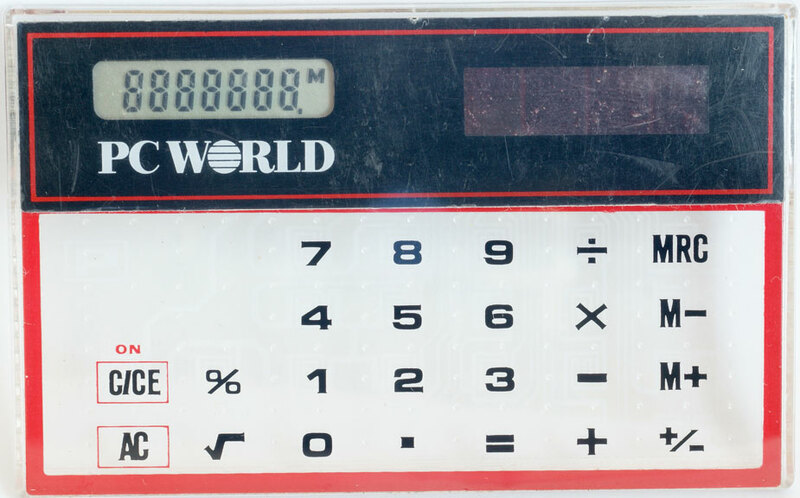 The Old Calculator Web Museum has a video clip of the STW-10 working away. I remember looking in amazement at a similar calculator in my Dad's office when I was a little kid. He still had that calculator in his office when I was in college. My brother in law's dad use to work for Friden selling office machines. 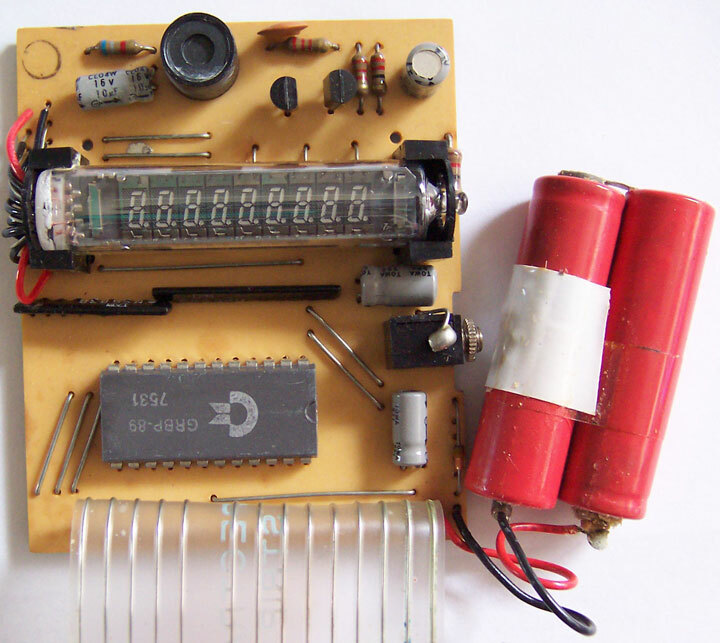 The Old Calculator Web Museum indicates that Friden produced the EC-130 "generally regarded as the first transistorized electronic calculator," signaling the end to electromechanical calculators. 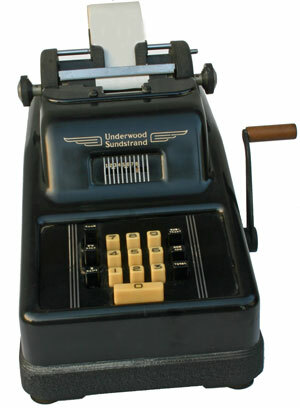 Underwood Sundstrand 10 Key Adding Machine (Large image) Sundstrand produced the first adding machine with a modern 10 key layout. The ten key layout is the same that is used today on computer keyboards, calculators, and cash registers. People who need to calculate numbers quickly learn to input the numbers without looking just like a touch typist. According to the Swedish Typewriter Page - Sundstrand, Sundstrand was founded by Swedish immigrant Oscar Sundstrand of Rockford, Illinois. That site identifies the first Sundstrand with the modern keyboard as coming from 1912 although A Brief History of Mechanical Calculators identifies the date as 1914. 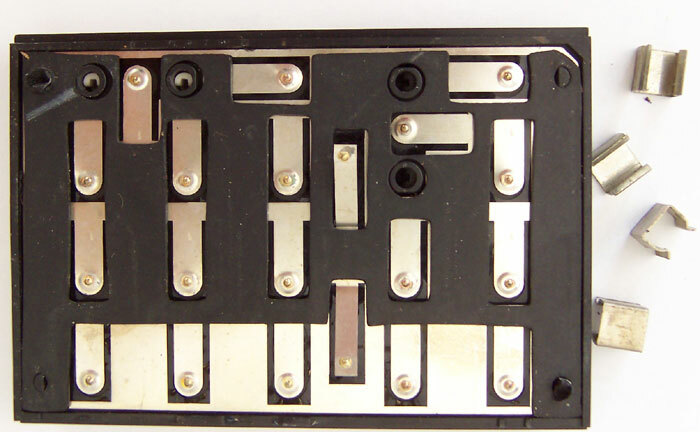 As indicated above, the ten key Dalton preceded the Sundstrand, although it had a two row key arrangement different from the modern three row design introduced by Sundstrand. According to A Brief History of Mechanical Calculators Sundstrand sold the rights to Underwood in 1927 although the Computing History Museum identifies what appears to be an Underwood Sundstrand like mine which they estimate is from 1920. My Underwood Sundstrand was purchased through an ad on Craigslist in the Clairemont area of San Diego on 6-13-08 with 5 typewriters for $75. I think we allocated around $20 to this machine. It is in excellent cosmetic condition and appears to work although it needs a new ribbon and I'm not sure exactly how it works. A Brief History of Mechanical Calculators indicates that a new one in the 1920s cost around $300. Adjusting that for inflation, $300 in 1929 equals $1,929 in 2008 dollars! It weighs 30.4 pounds on my bathroom scale. One should really appreciate a $1 Walmart calculator that does a lot more and weighs a lot less! 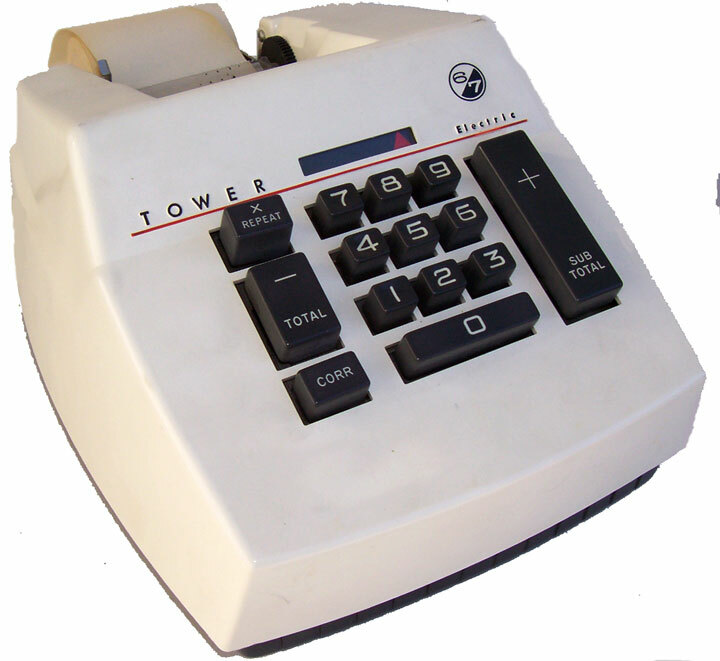 Tower 6/7 Adding Machine Model #603.58200. Large image. Tower was a Sears brand. 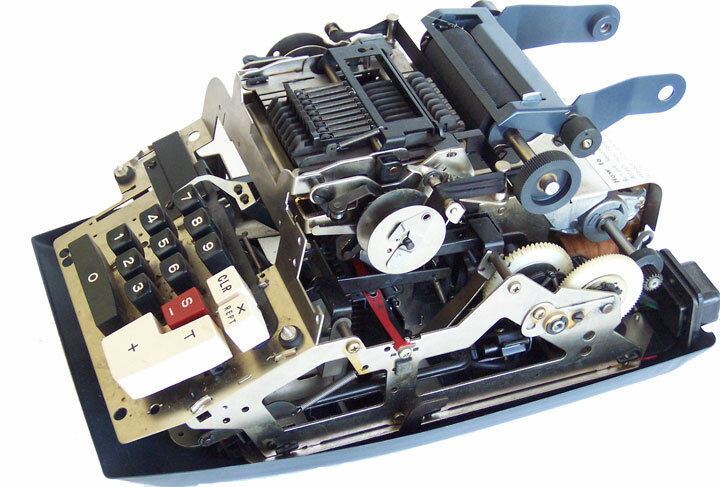 The adding machine was made in the U.S.A. The 6 appears to refer to the number of input digits. I assume the answer can be 7 digits. Sears made an almost identical Tower 7/8 adding machine (Model #603.58210) which apparently allowed for one more digit. I found this information by an eBay entry for one which was listed as "buy it now" for $20. The day before it had been listed for $29.95 and several weeks earlier for $39.95. Unfortunately, I could not find any other information on this machine. My guess it is from the 1960s. The machine originally belonged to the father, now 80 years old, of the women selling it. 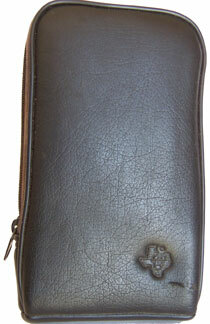 It is in very good cosmetic condition and comes with a zippered case. It appears to work fine, but the ribbon is completely dried out. In form and function it is very similar to the Commodore 207 above. Like the Commodore it is an electrically driven mechanical device. I purchased it for $3.50 at a Fletcher Hills (El Cajon, CA) garage sale on 12-9-06. Internal View. Slide Rules, were used by students, scientists, mathematicians and engineers to perform complex calculations since the 1600s. The basics of a slide rule can be demonstrated with two rulers. Line up the numbers of two rulers. Move the bottom ruler so that the left end of the bottom ruler is lined up with a number on the top ruler. Let's say you lined up the end of the bottom ruler to the number three on the top ruler. Now look at, for example, the number 5 on the bottom ruler. Then look up at the number on the top ruler. It is 8. You have just added 3 + 5 to get 8. Slide rules don't use linear scales like a ruler, however. Instead they use logarithmic scales. This allows you to do multiplication and division on slide rule. It is usually only accurate to one or two decimal places and you need to use common sense to determine the decimal place. Slide rules worked for hundreds of years, however. Scientific calculators like the TI 50 and HP 35 quickly displaced slide rules in the early 1970s just when I was entering high school. I bought an inexpensive slide rule while in high school to see what it did. I learned what I just recited above and then put it away. It seemed a bit too complicated for me. I have three slide rules today. One was purchased on eBay for about $5 (shipping included with some other items). Another is a gift from my sister, a fellow purveyor of fine vintage merchandise. A third was purchased with a movie camera and some other items at a garage sale for $5. There are dozens of excellent sites on slide rules a few of which are listed below. It is apparent that those scientist, engineer, mathematician types who like slide rules also like to make Web sites! Dave's Slide Rules!, an extensive collection and discussion of slide rules with many links. Hewlett Packard Museum Slide Rules, a good introduction to the history, theory and use of slide rules. Death of the Slide Rule, by James Redin, a description how the HP 35 and other pocket calculators resulted in the "death" of the slide rule. Ron Manley�s Slide Rule Site, an extensive discussion of slide rules including extensive information how to use them. A good starting point is the Basics of Slide Rule Use. Jim Askew's Slide Rule Operations. JavaSlide Interactive Slide Rule, an interactive slide rule on the computer you can actually use with digital read outs of the solutions. Sheldon Brown's Slide Rules and Bicycle Gears, the name says it all! 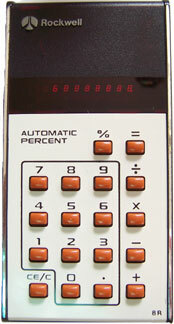 Pocket Adding Machine, a pocket adding device made in West Germany. Purchased on eBay on May 25, 2005 for $3.25 plus $4.50 shipping. It is fairly cumbersome to use since it doesn't automatically "carry" unlike a Comptometer. I remember devices like these sold at the grocery store when I was a kid. They make you appreciate electronic calculators. Abacus, purchased on eBay in 2005 for about $10. For detailed information on the history and use of the abacus, see the award winning site, Abacus, The Art of Calculating with Beads.